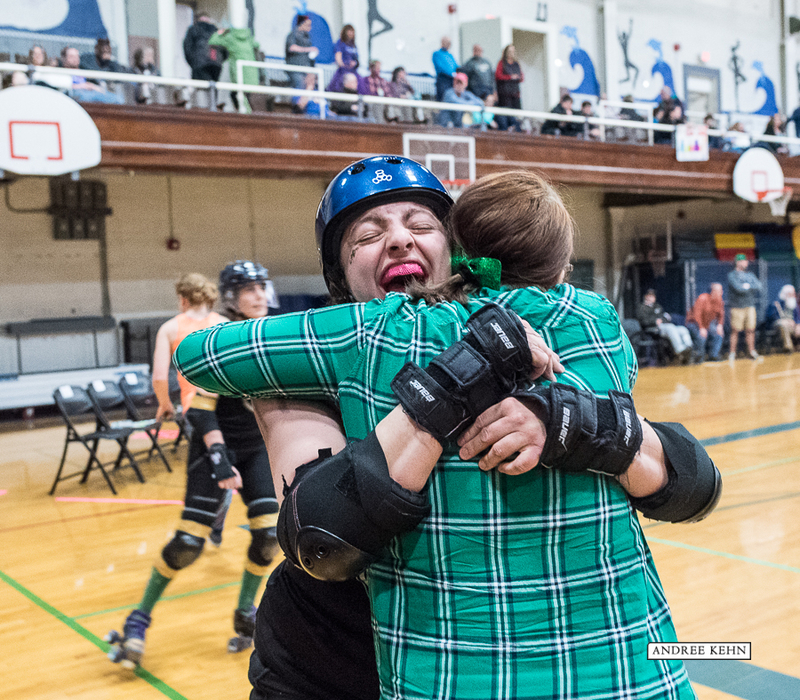 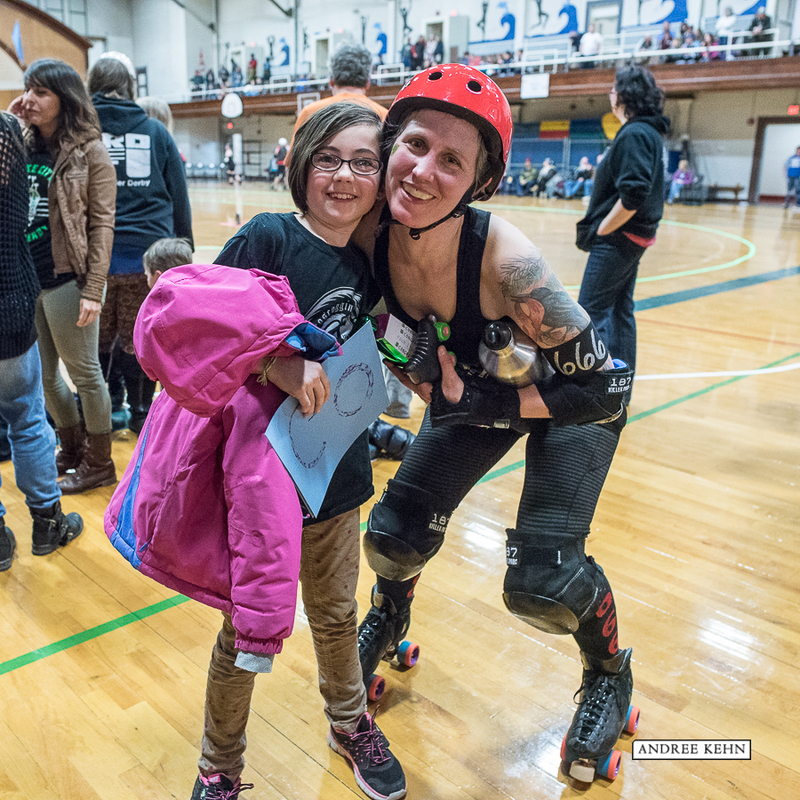 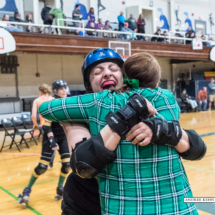 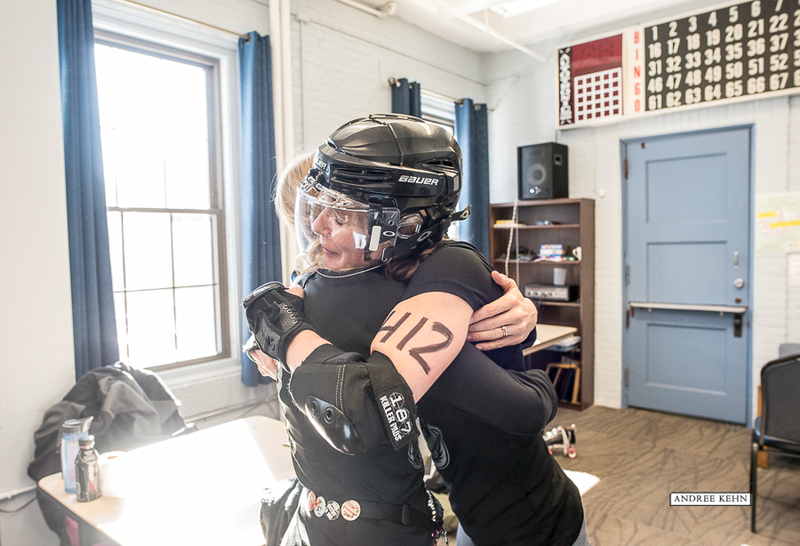 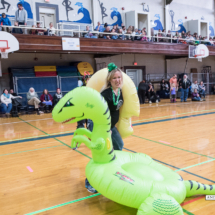 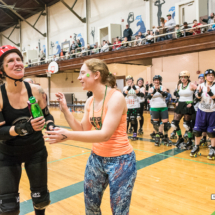 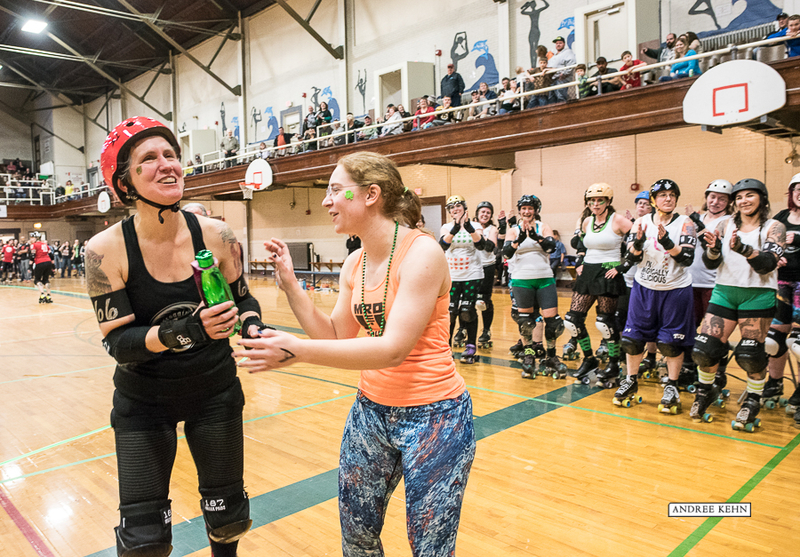 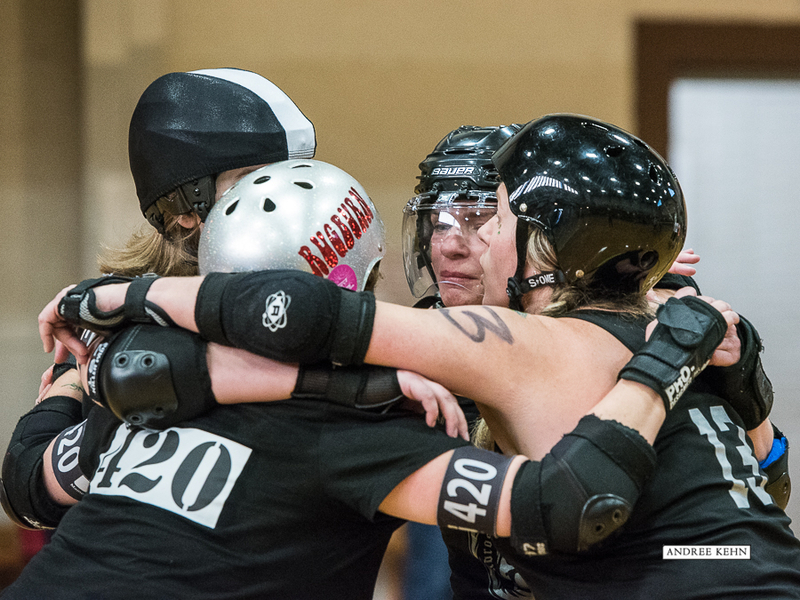 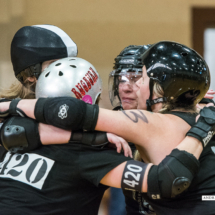 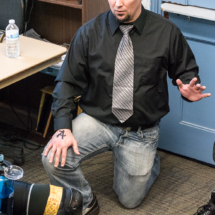 Rae "Razinkane" Kane gets a warm hug from Androscoggin Fallen Angels League president Heather "SugarBaby" Meehan during halftime of the leagues very first bout on Saturday at the Lewiston Armory. 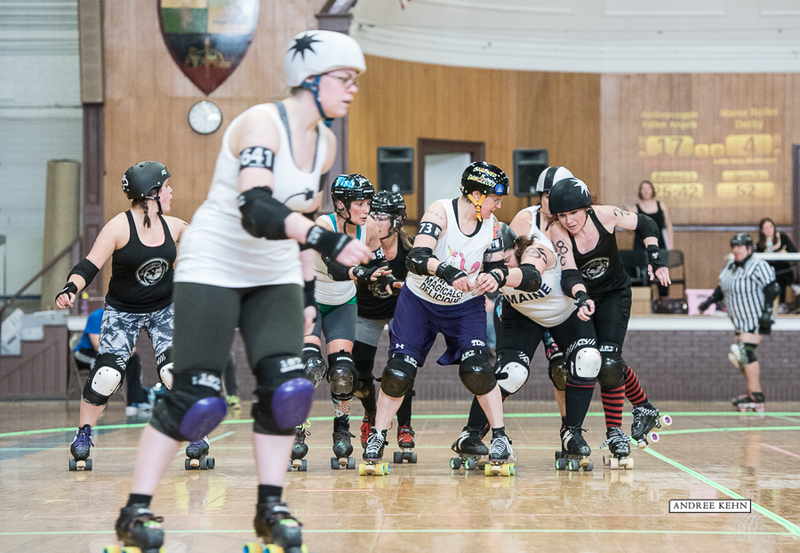 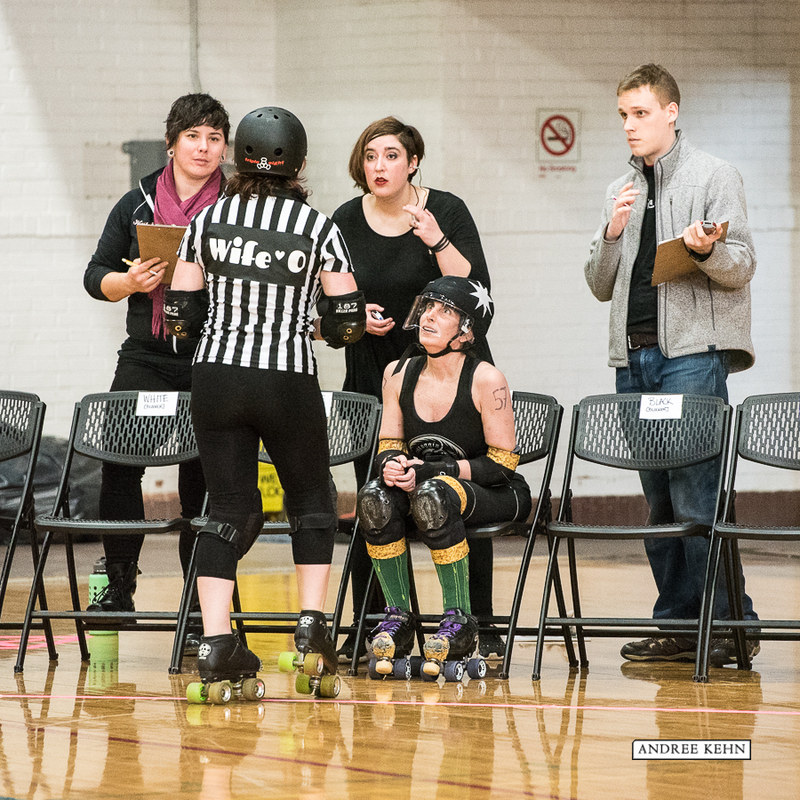 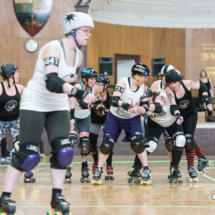 Frida Kallit, the ref and our two borrowed skaters, Chem and KillAny warm up as bench coach Saint Hooligan crosses the track on a mission. 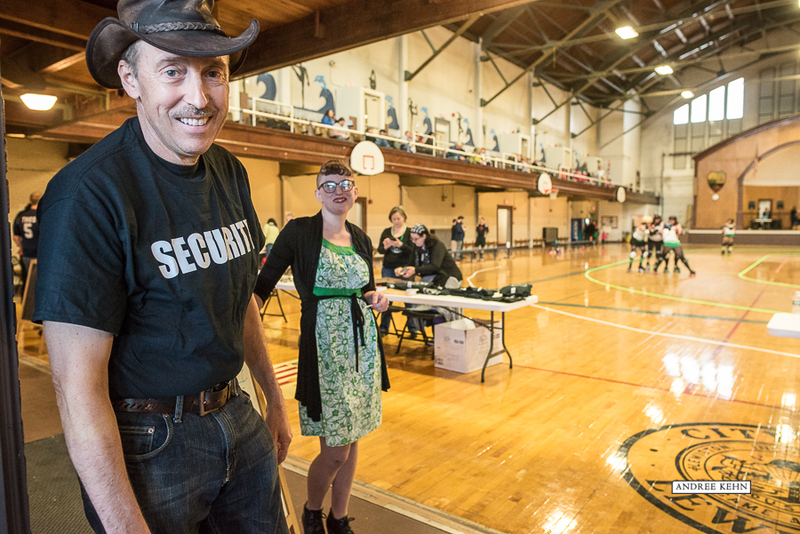 The Androscoggin Fallen Ag=ngles greet the visint team, Maine Roller Derby at the start fo the 4 Leaf Clobber bout held at the Armory on Saturday afternoon. 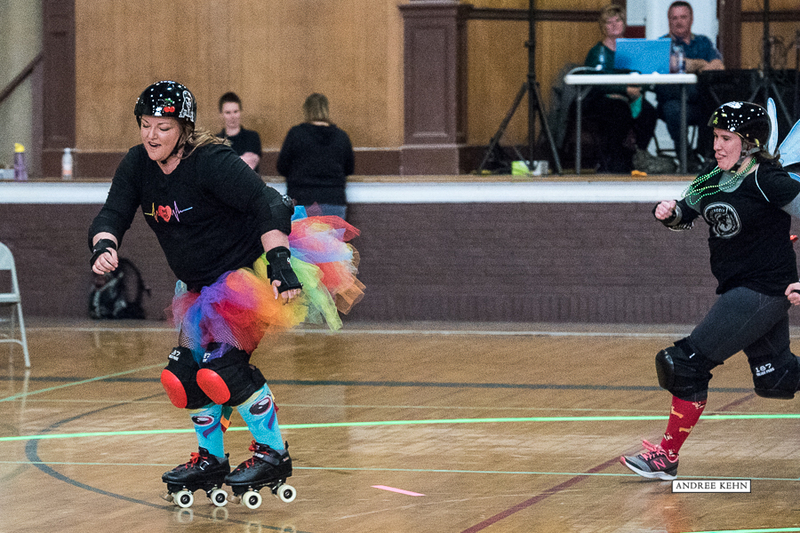 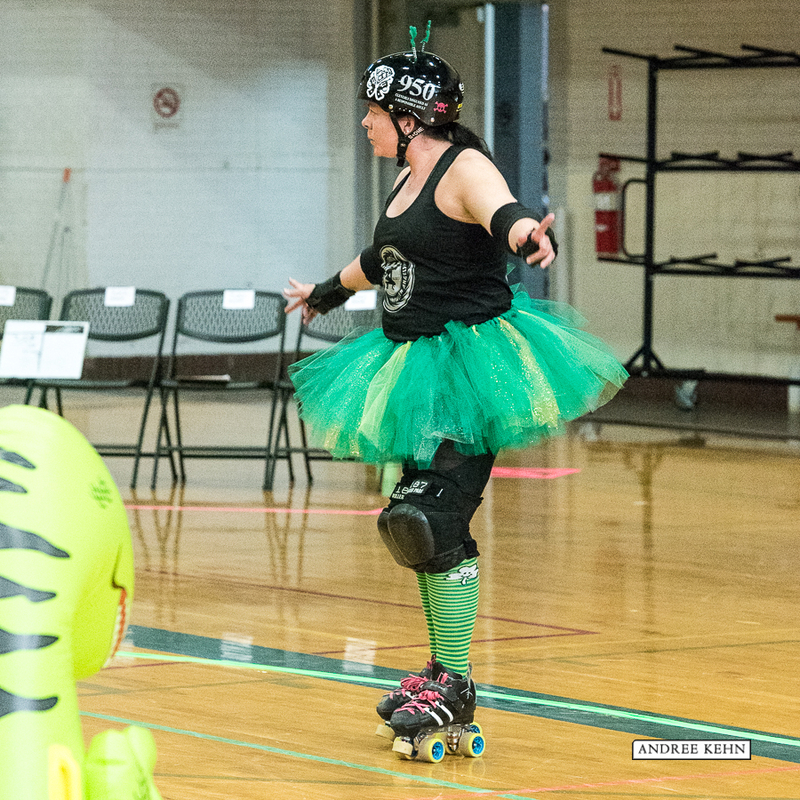 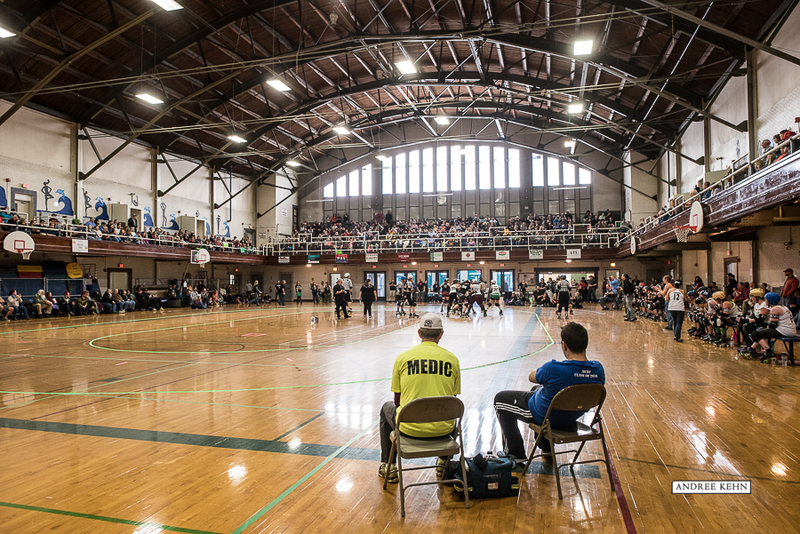 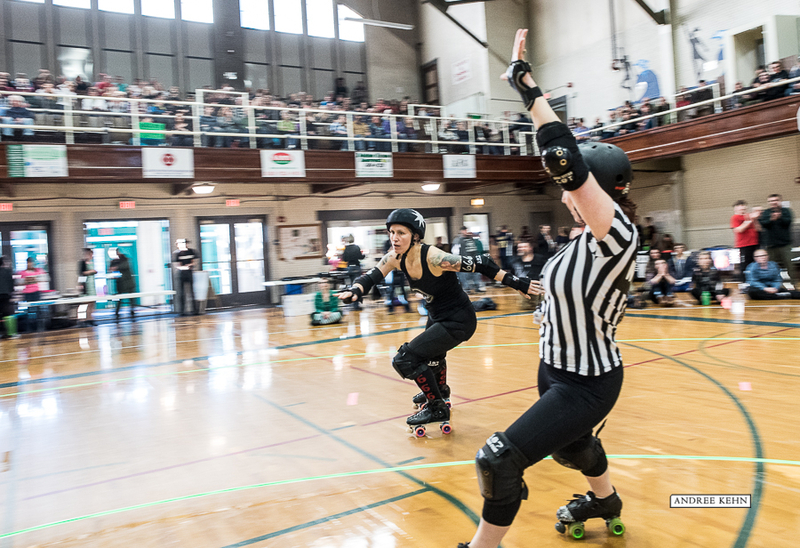 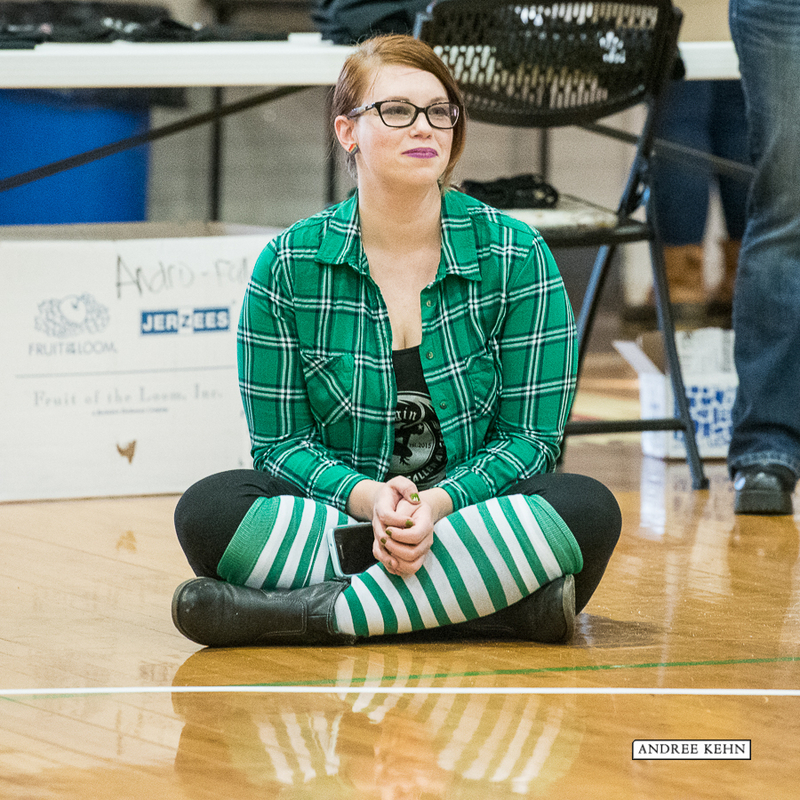 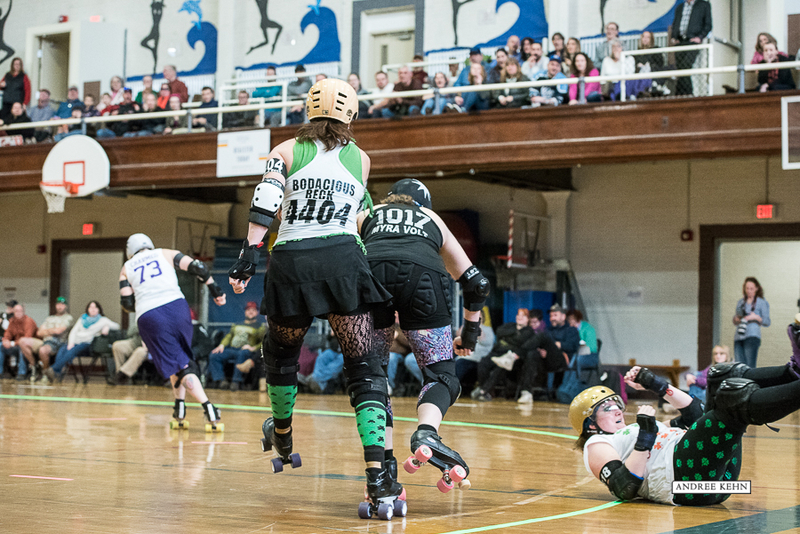 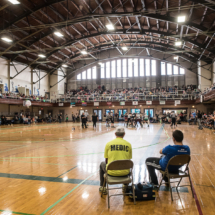 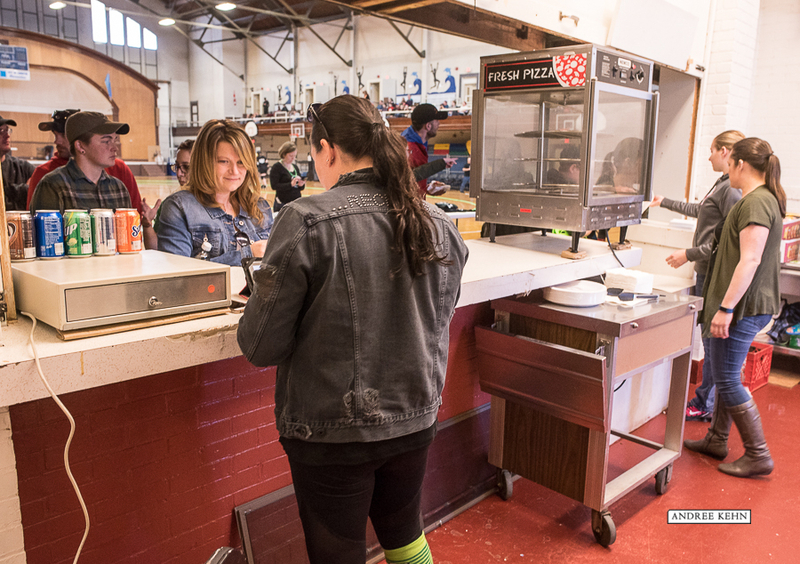 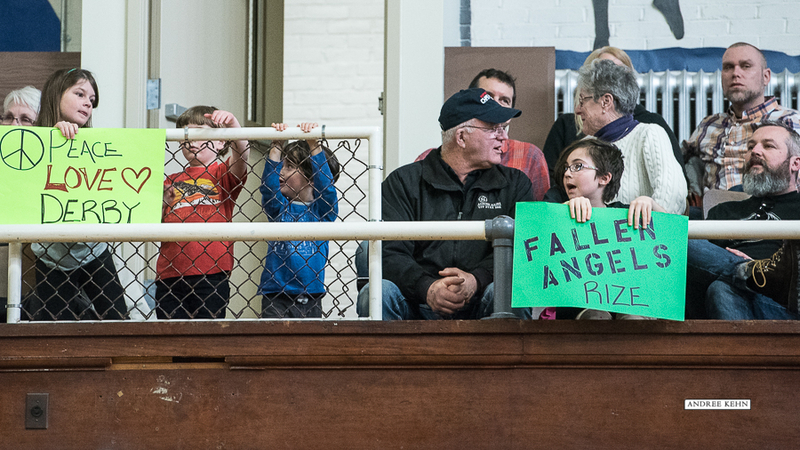 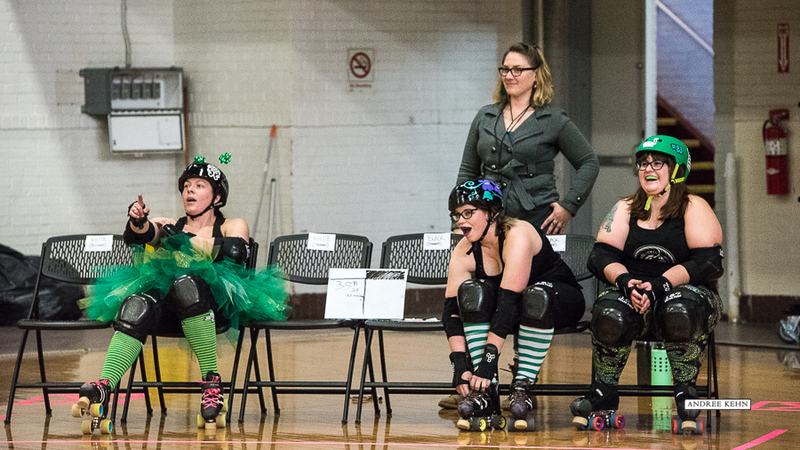 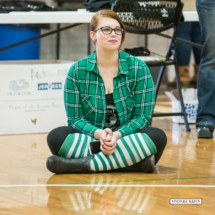 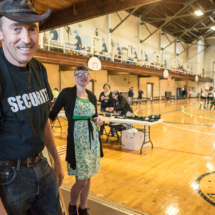 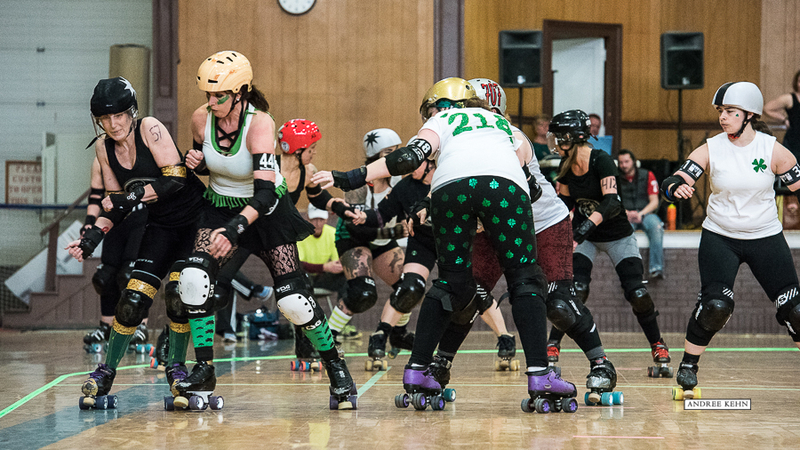 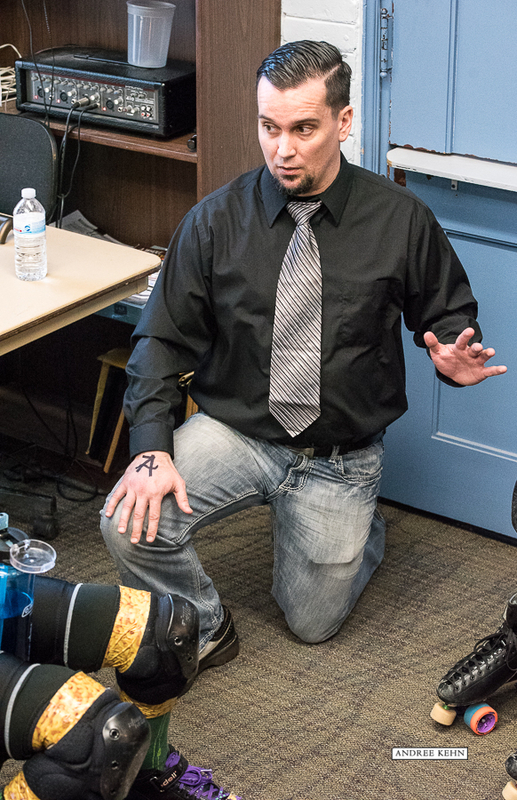 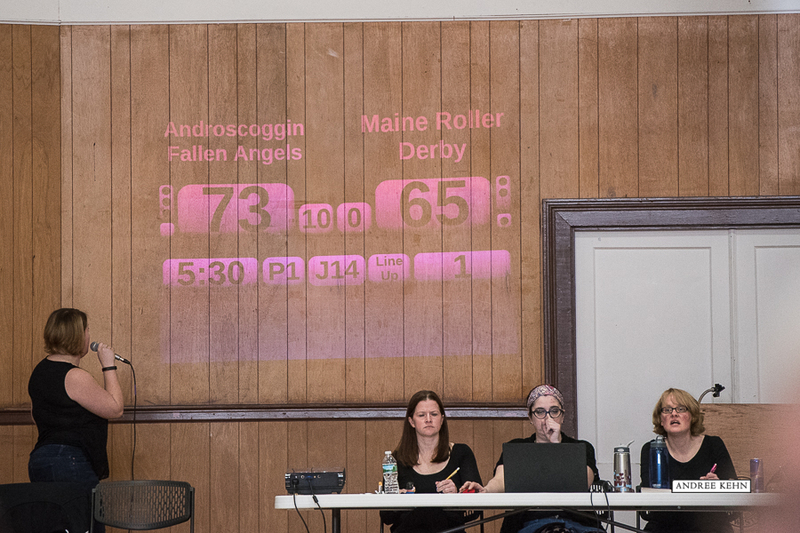 The Lewiston Armory hosted a large crowd for the Androscoggin Fallen Angel's first home roller derby bout on Saturday. 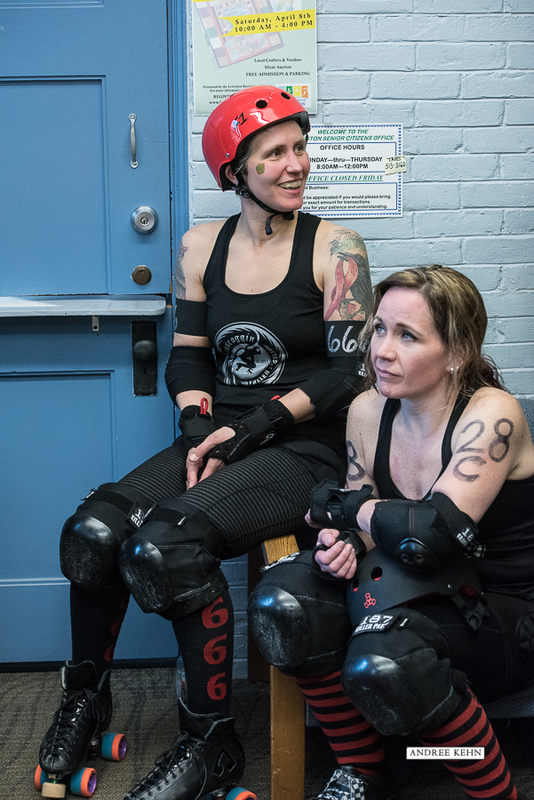 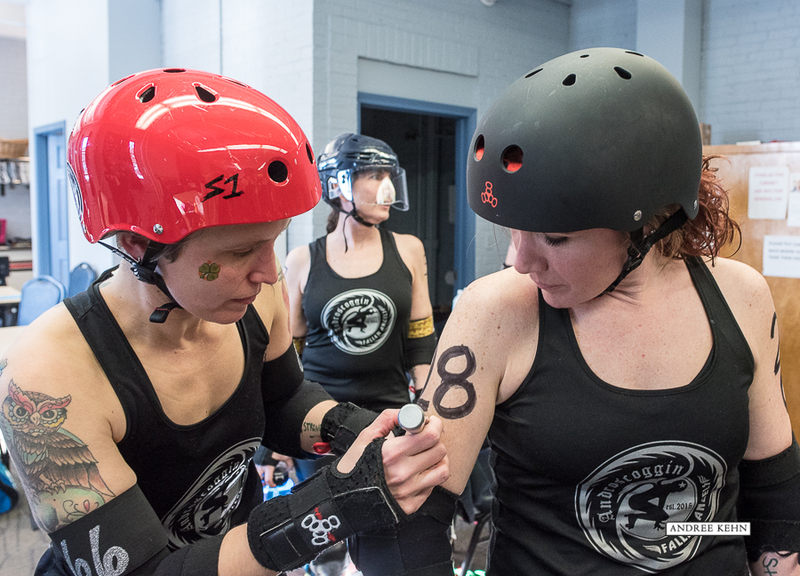 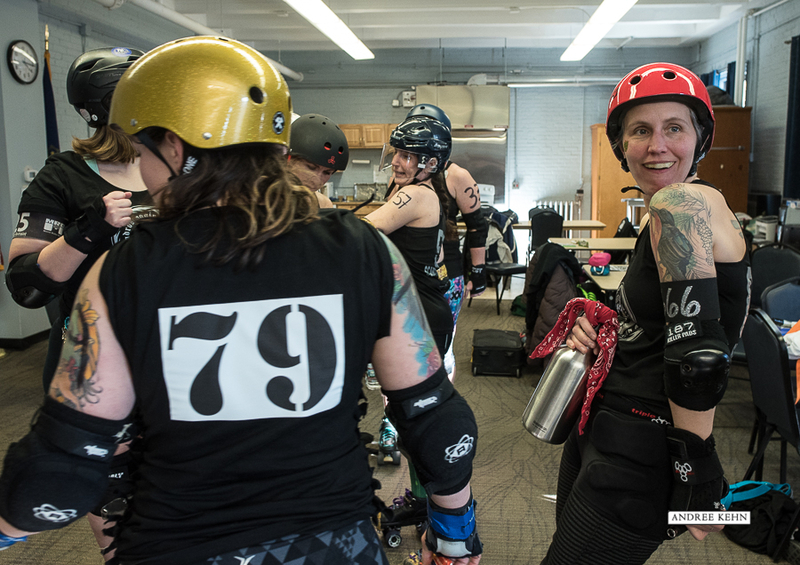 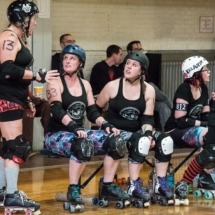 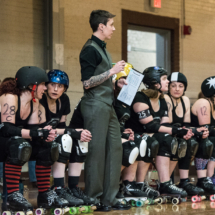 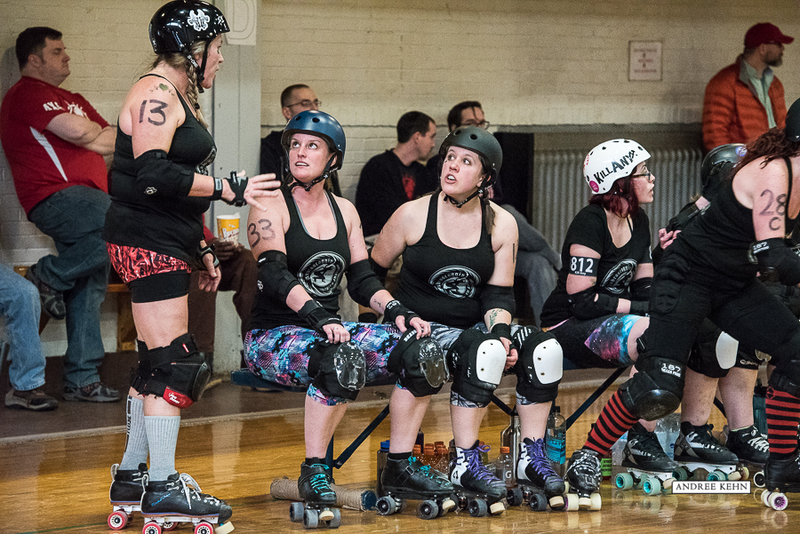 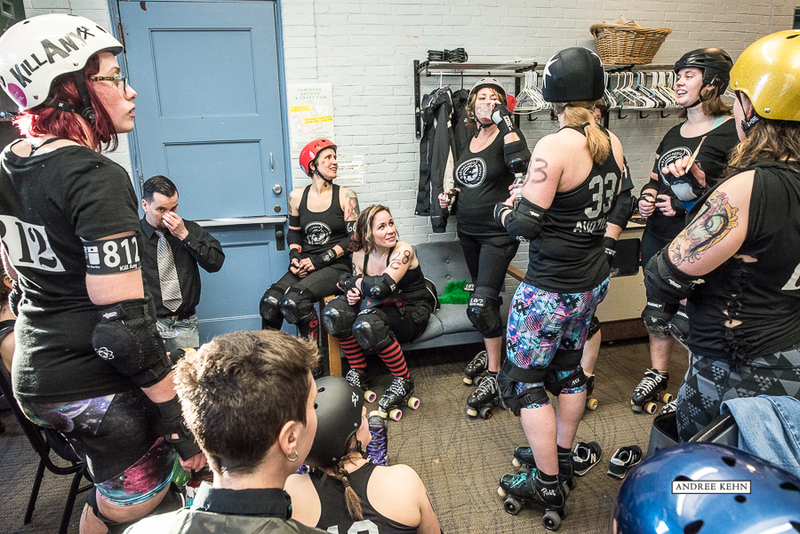 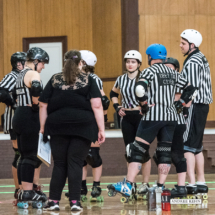 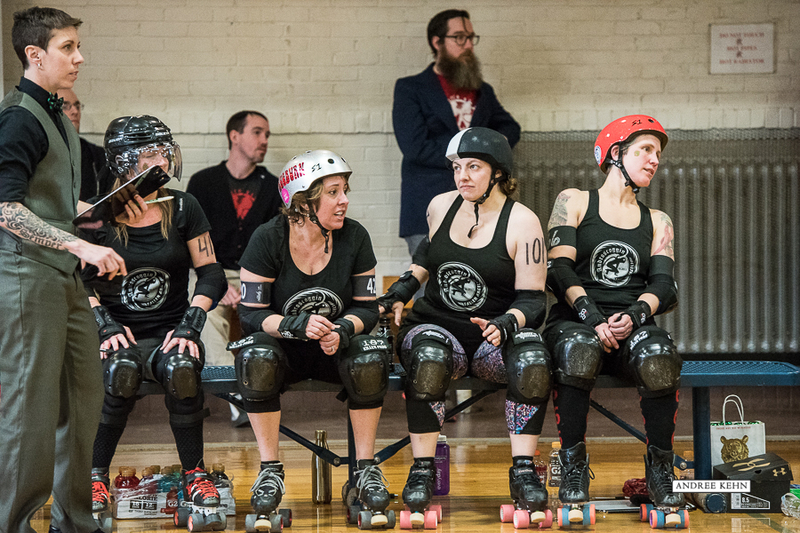 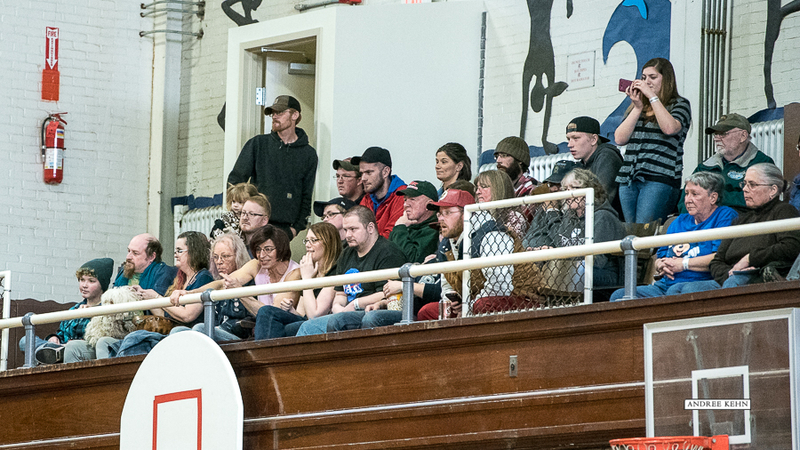 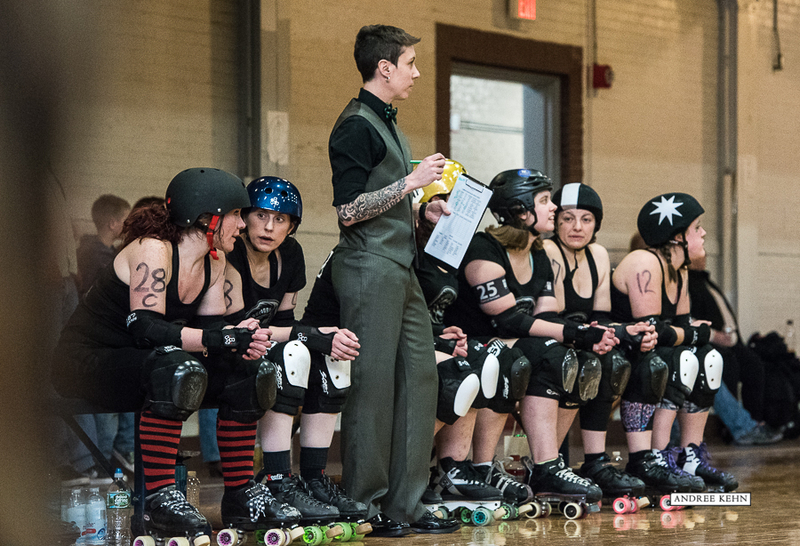 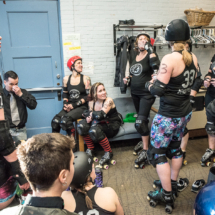 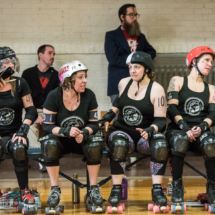 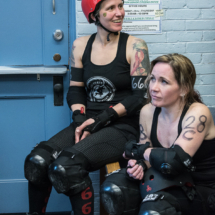 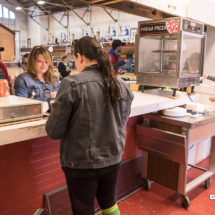 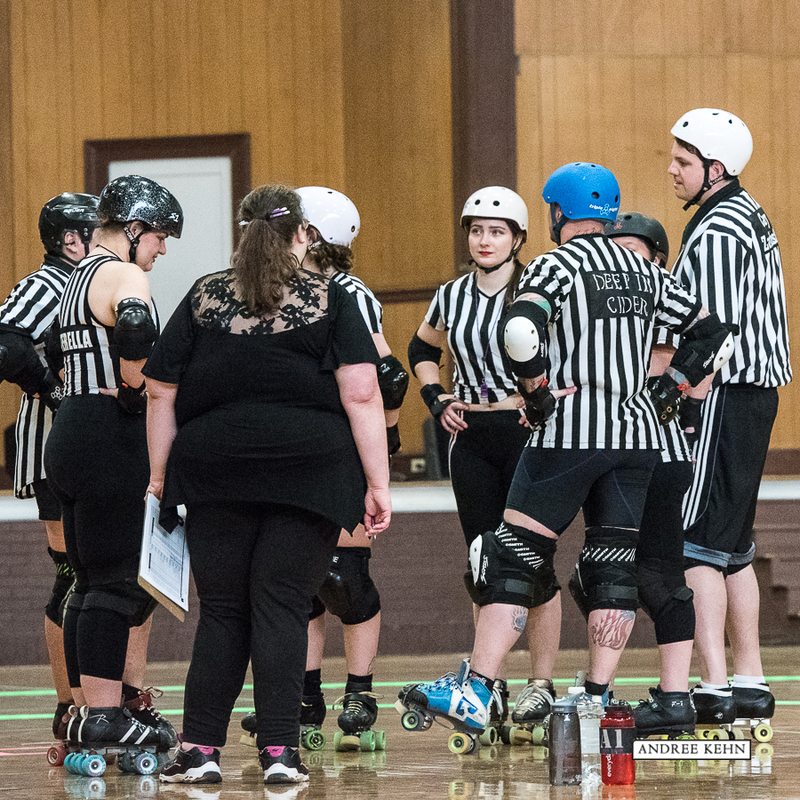 The Androscoggin Fallen Angels regroup during ahalf time break in the Armory on Saturday afternoon. 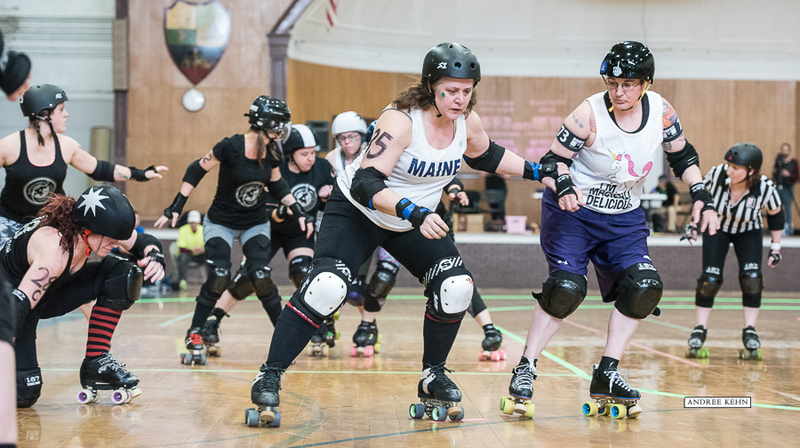 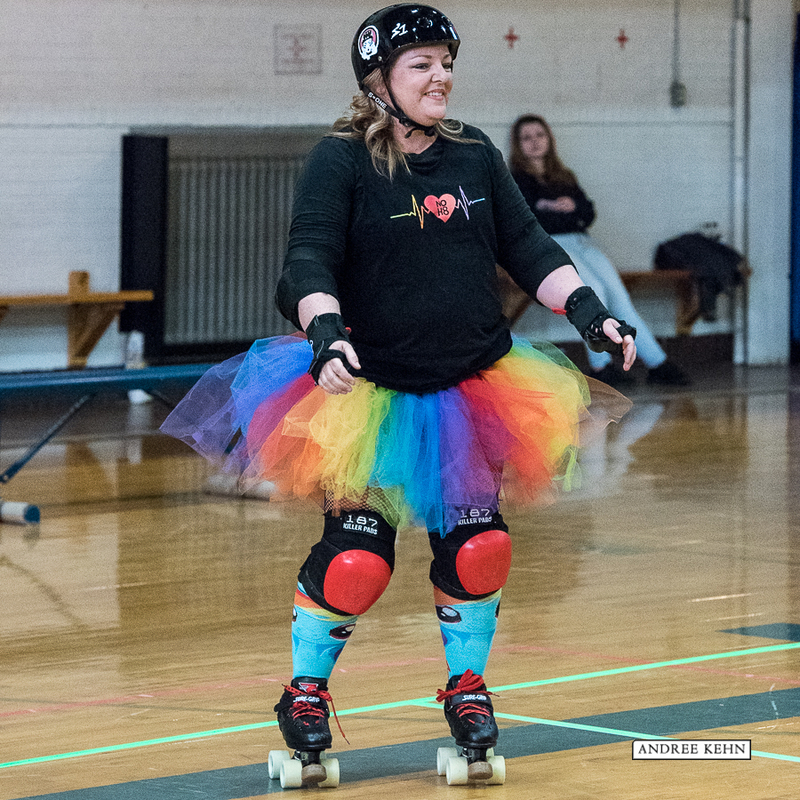 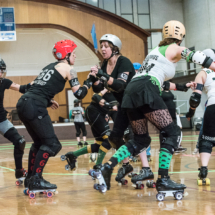 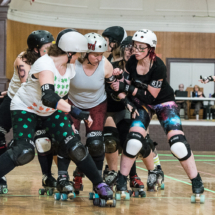 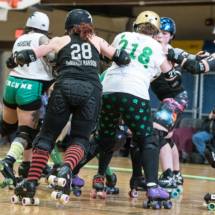 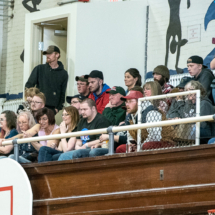 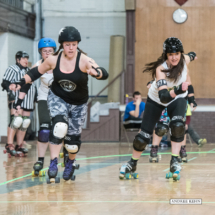 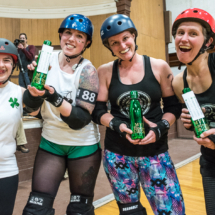 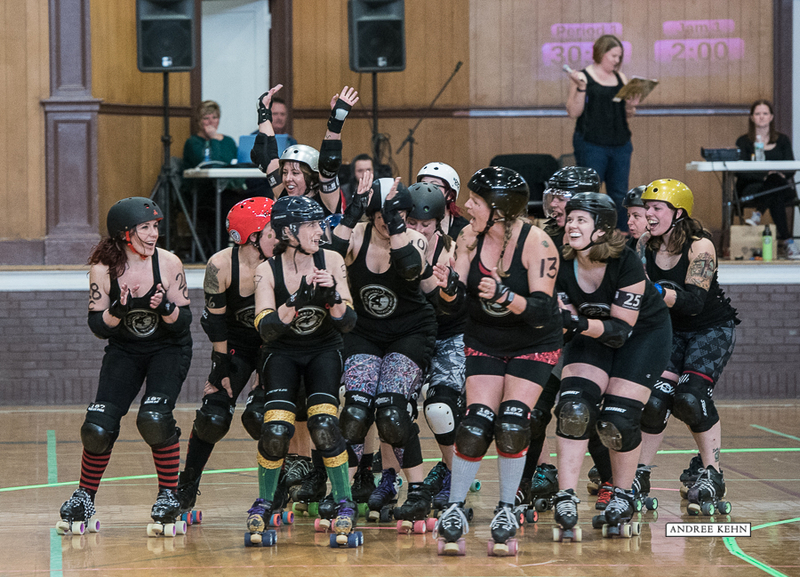 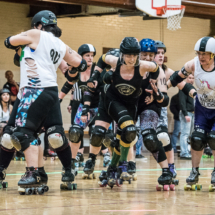 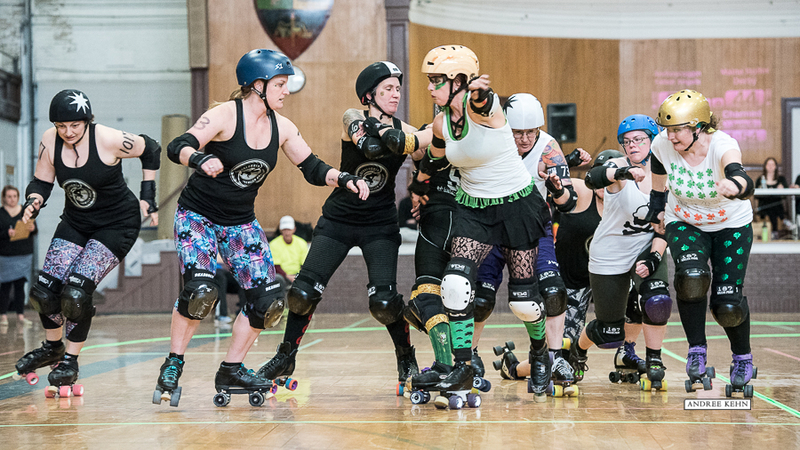 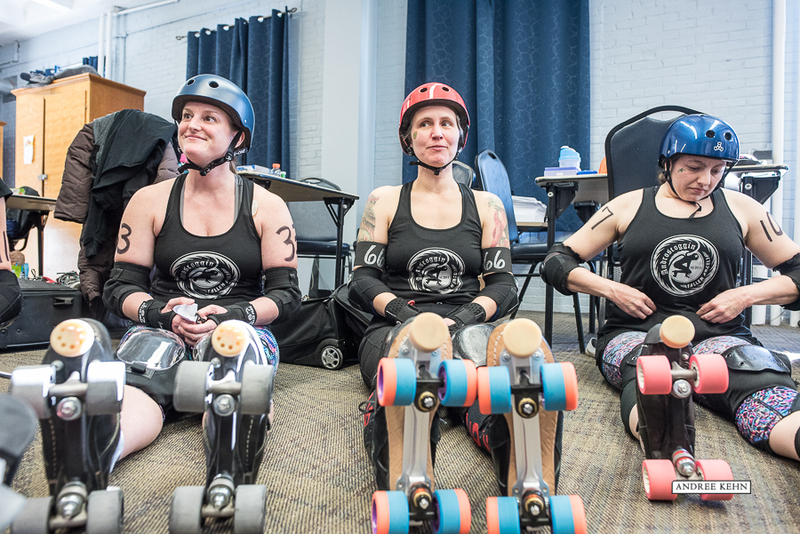 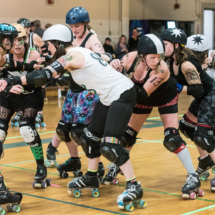 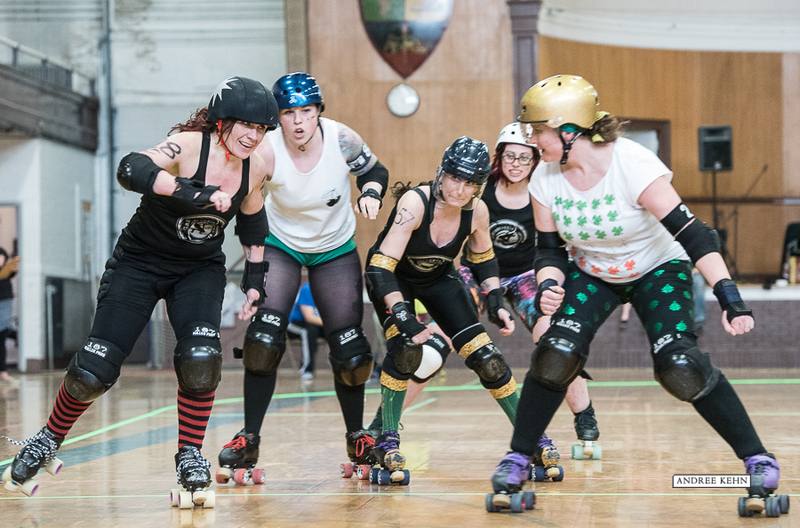 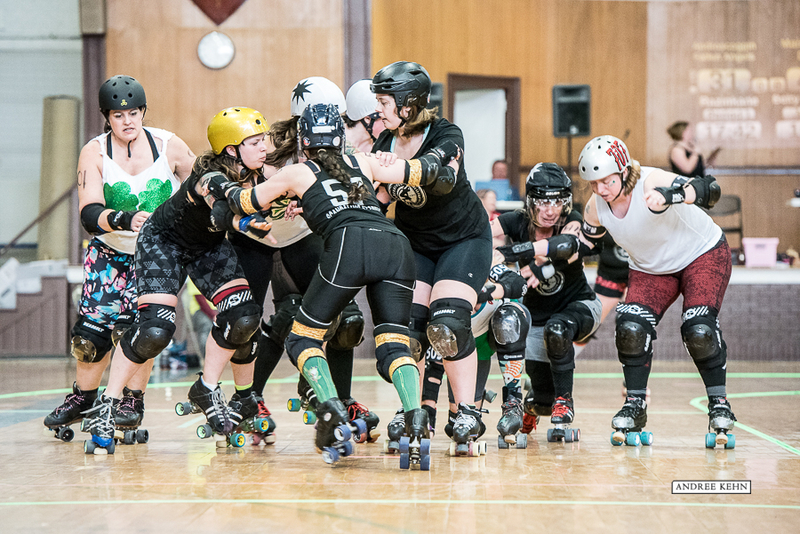 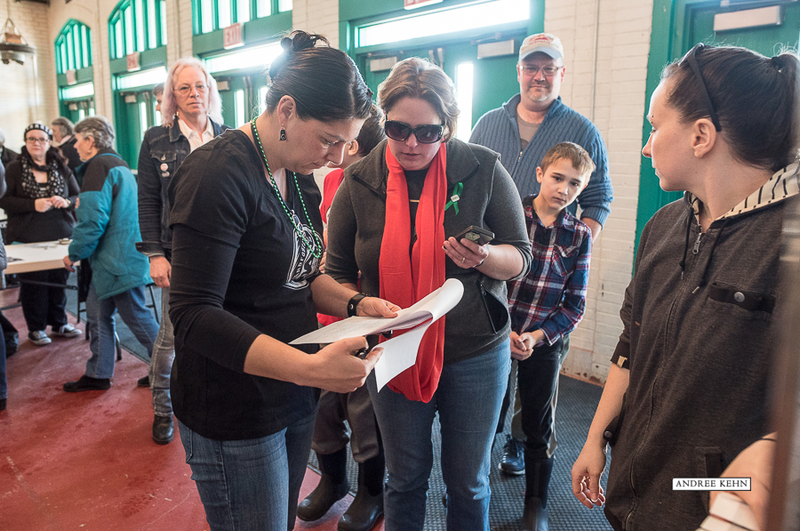 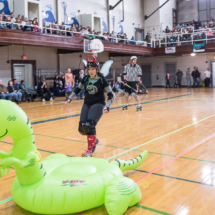 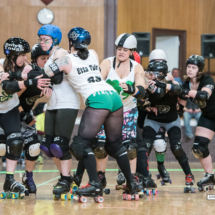 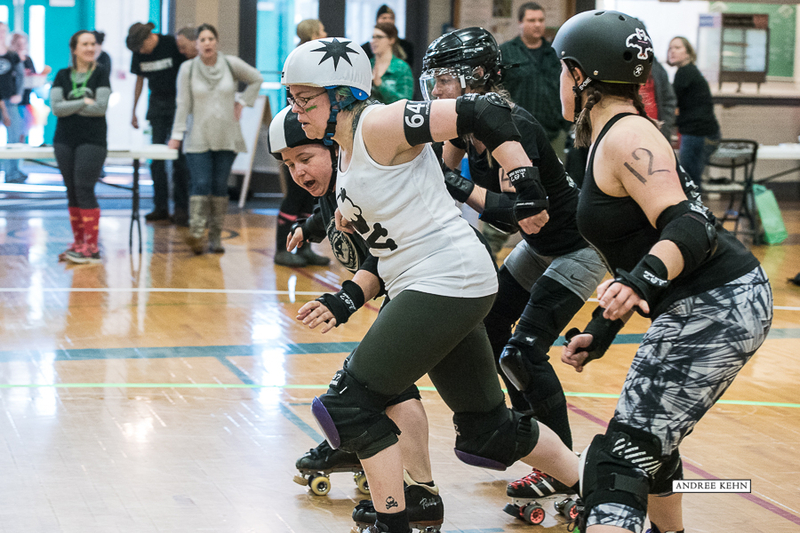 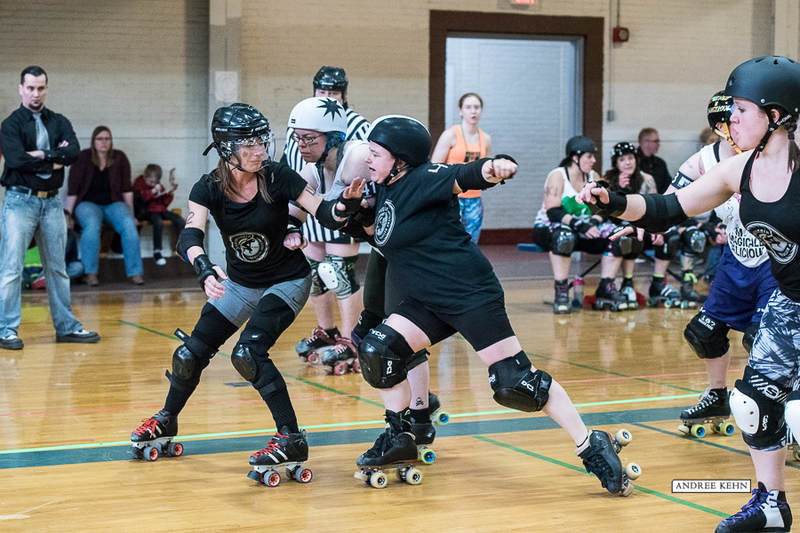 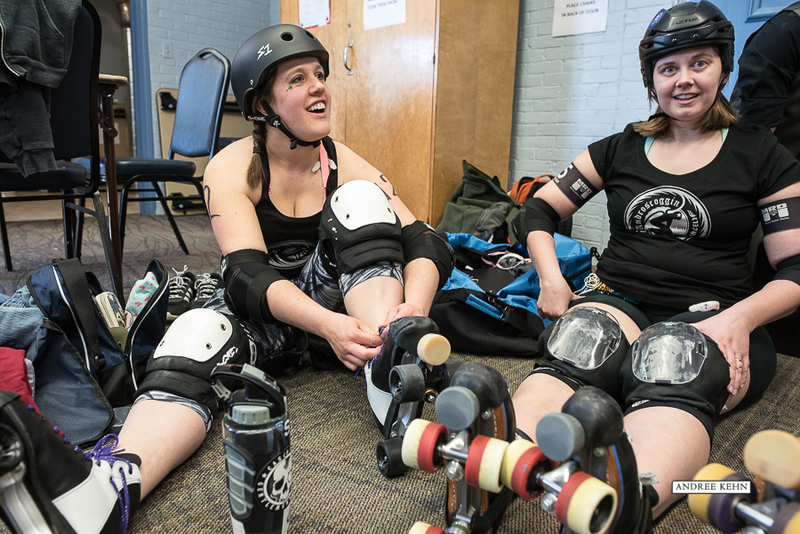 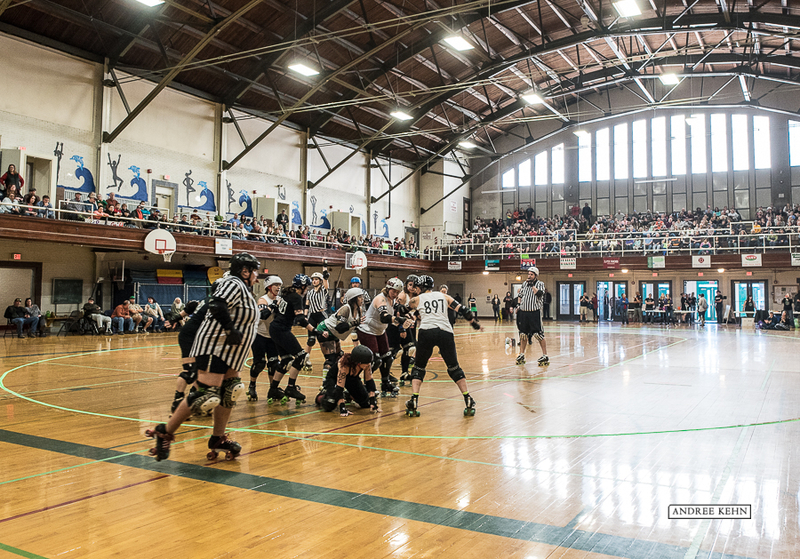 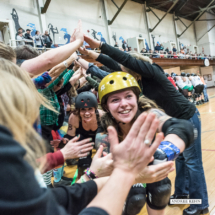 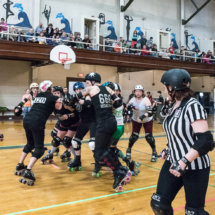 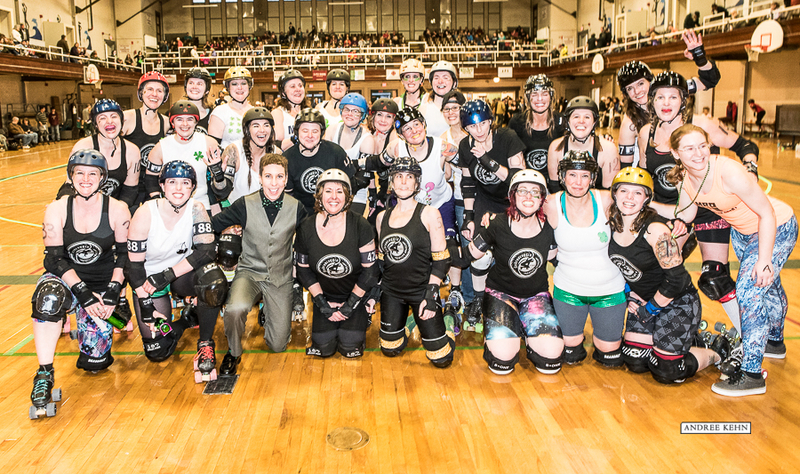 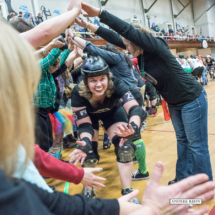 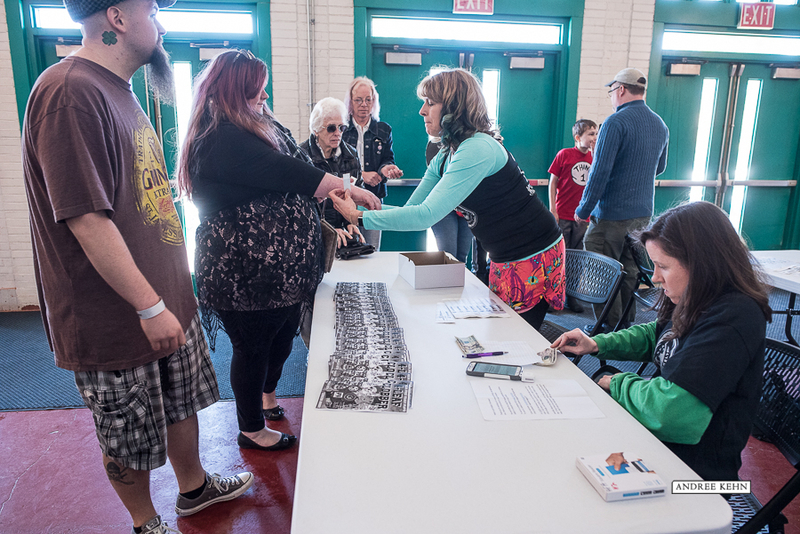 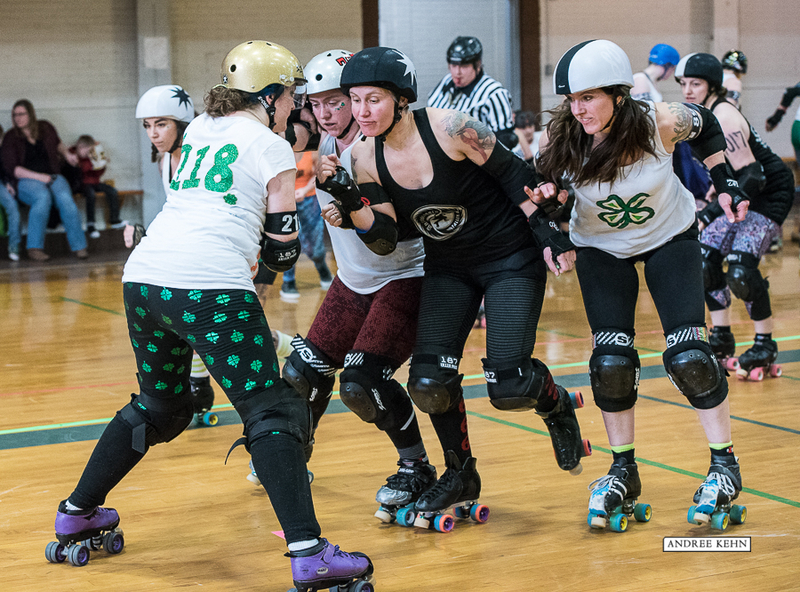 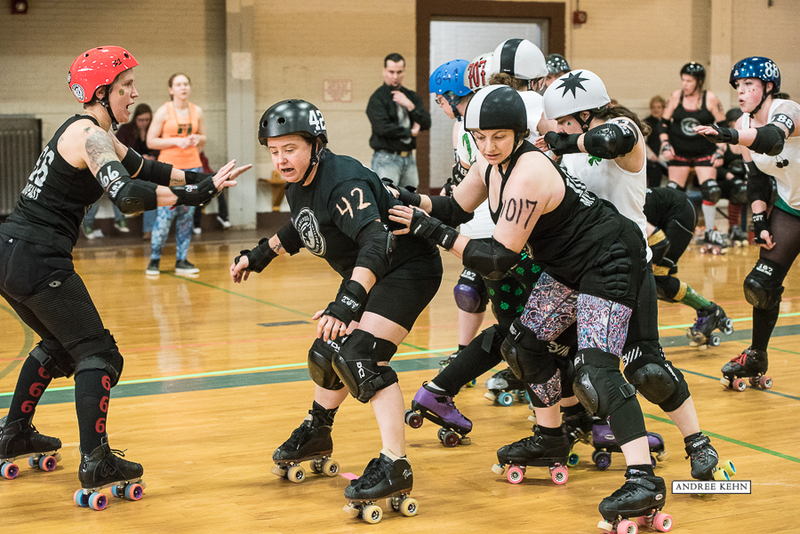 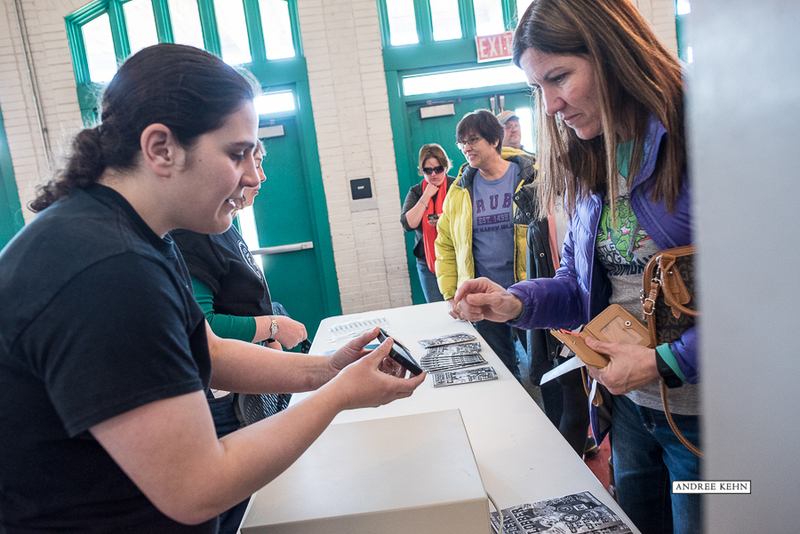 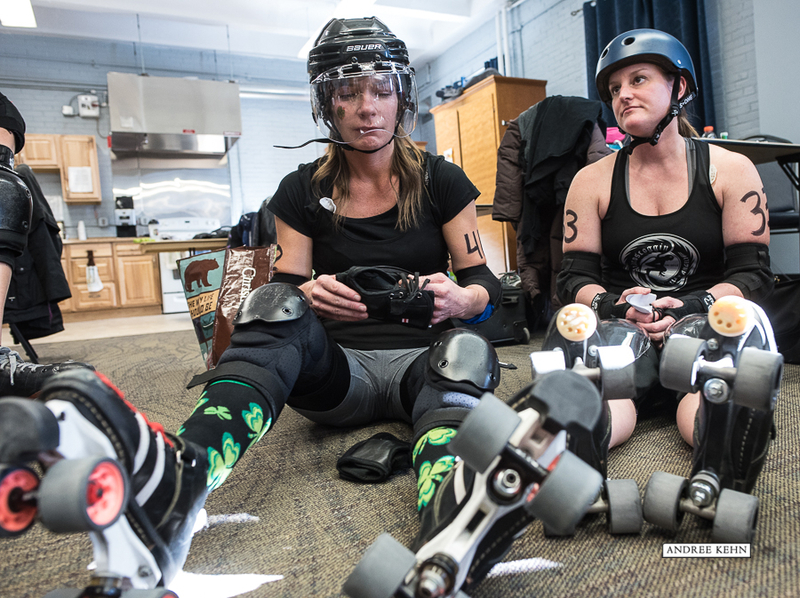 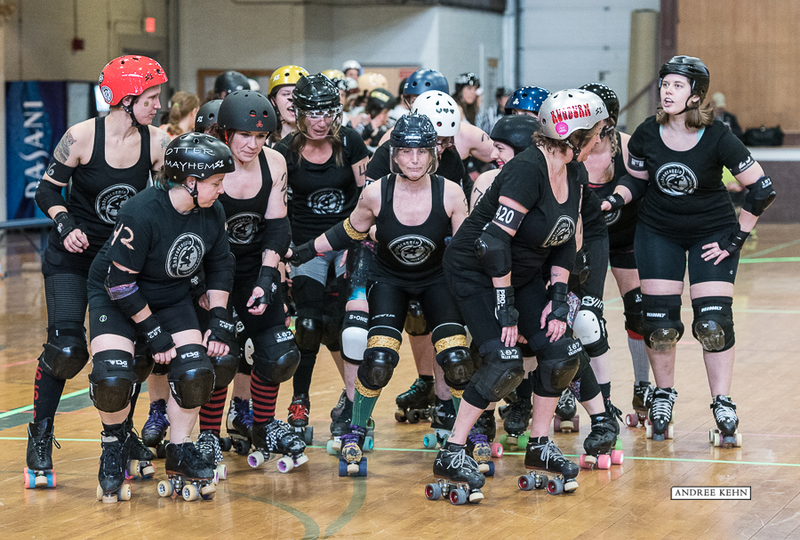 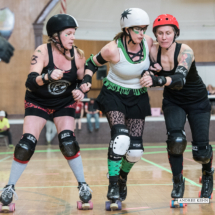 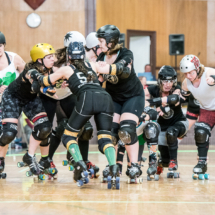 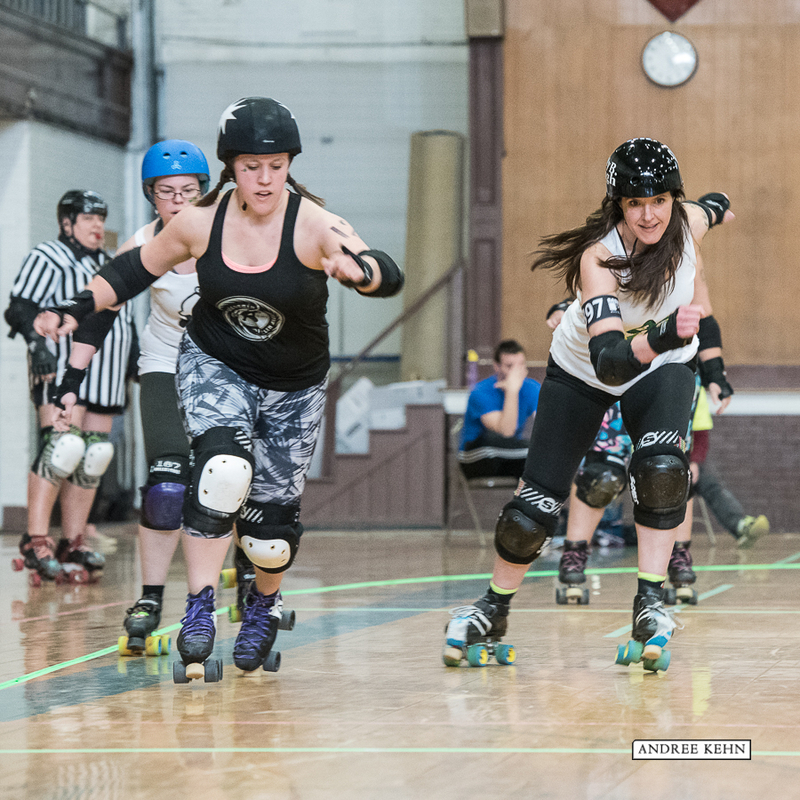 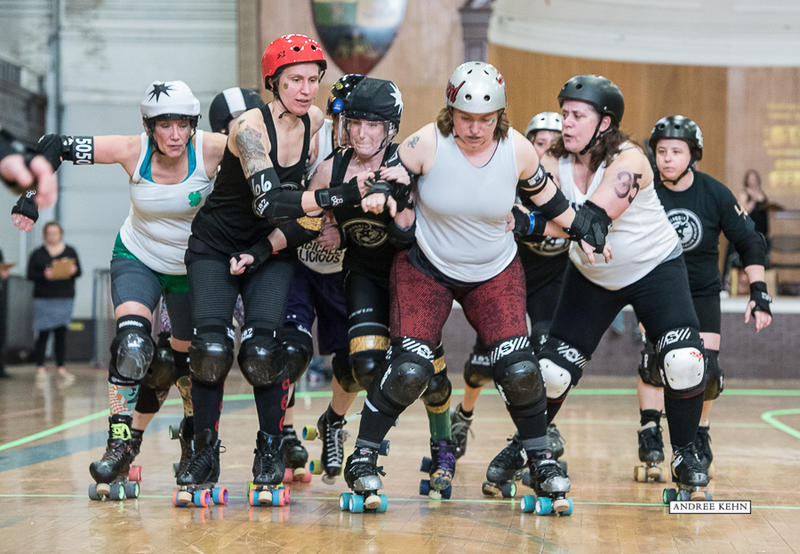 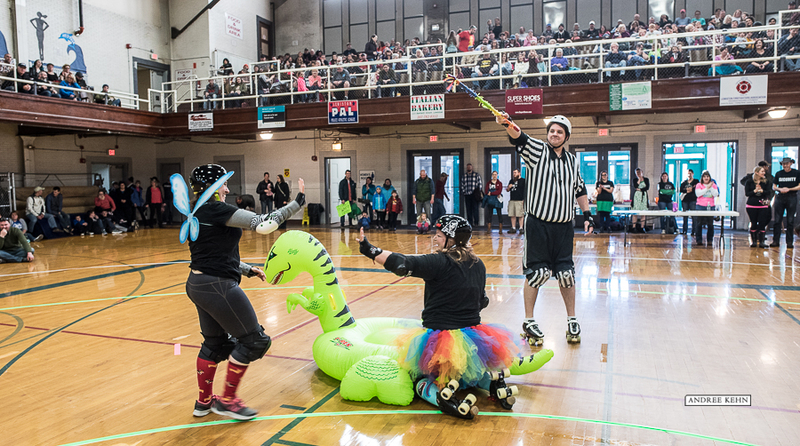 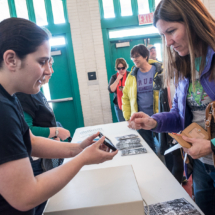 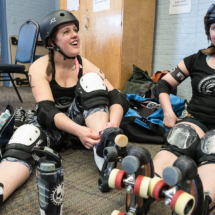 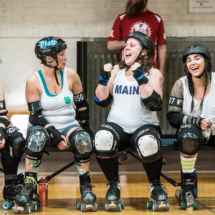 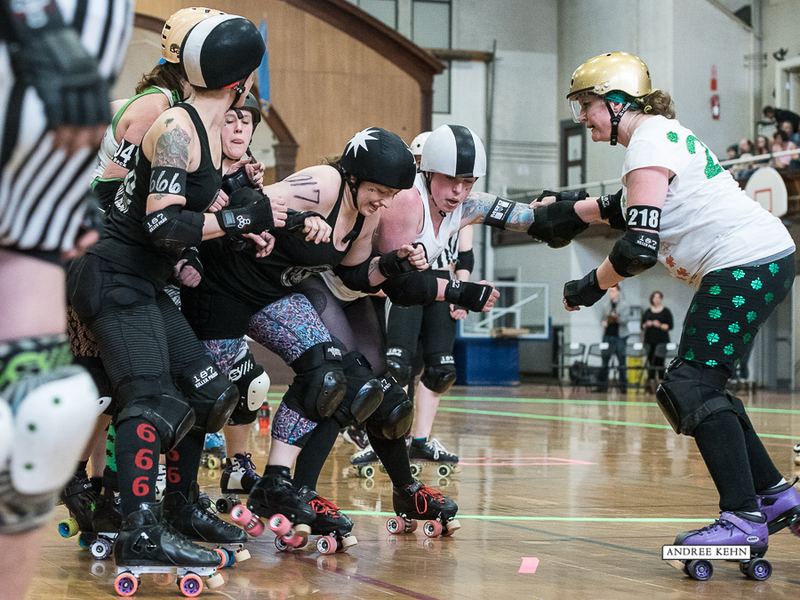 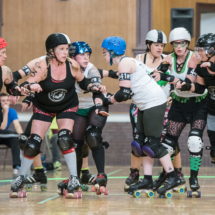 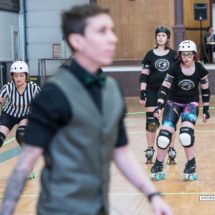 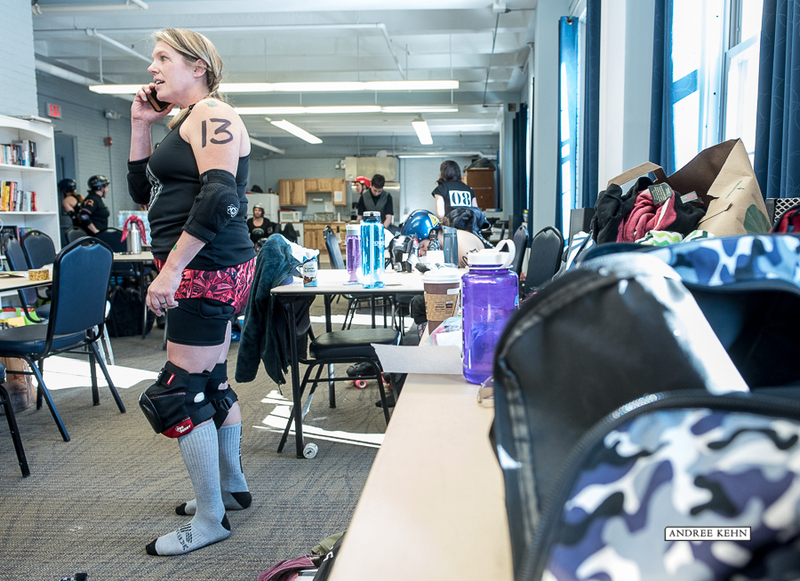 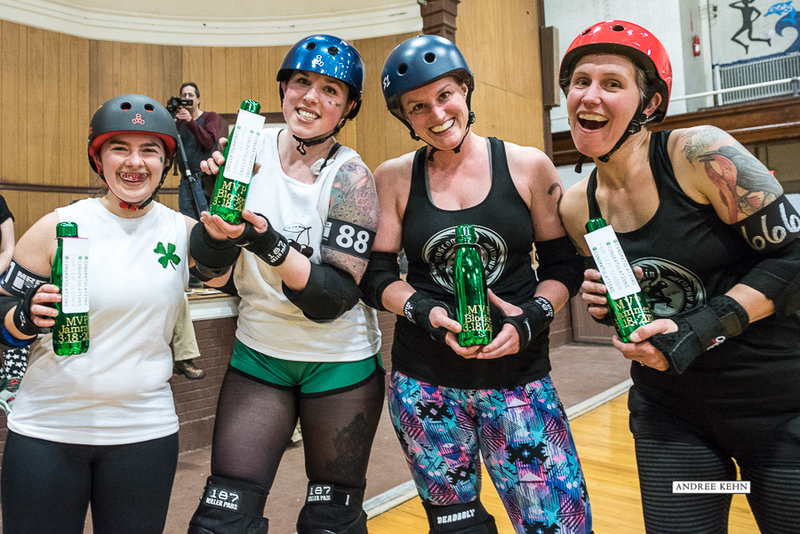 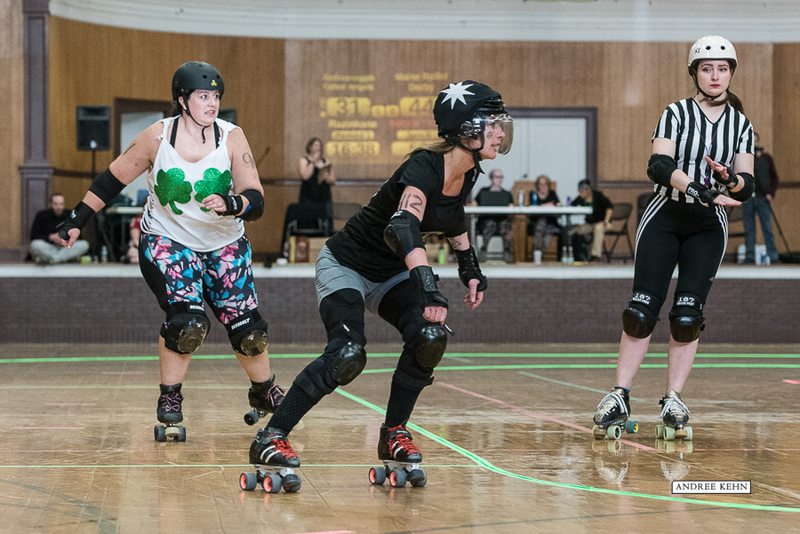 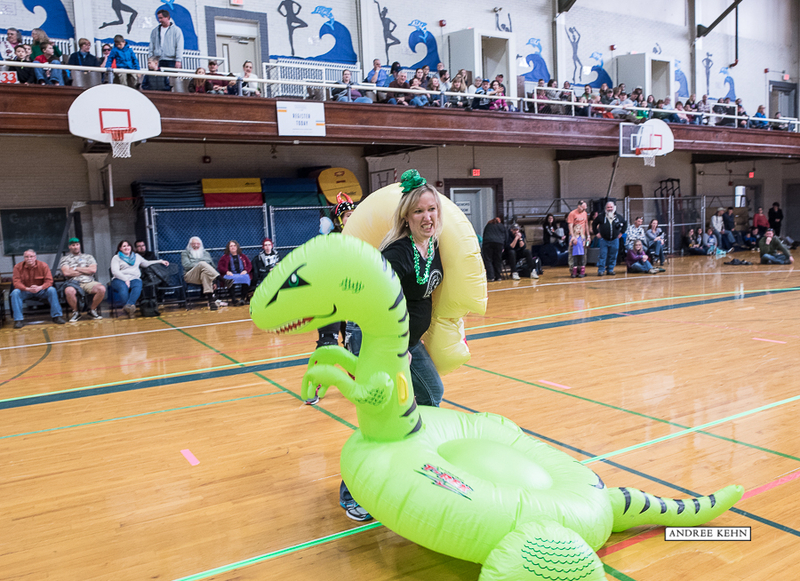 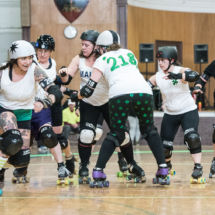 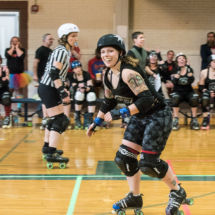 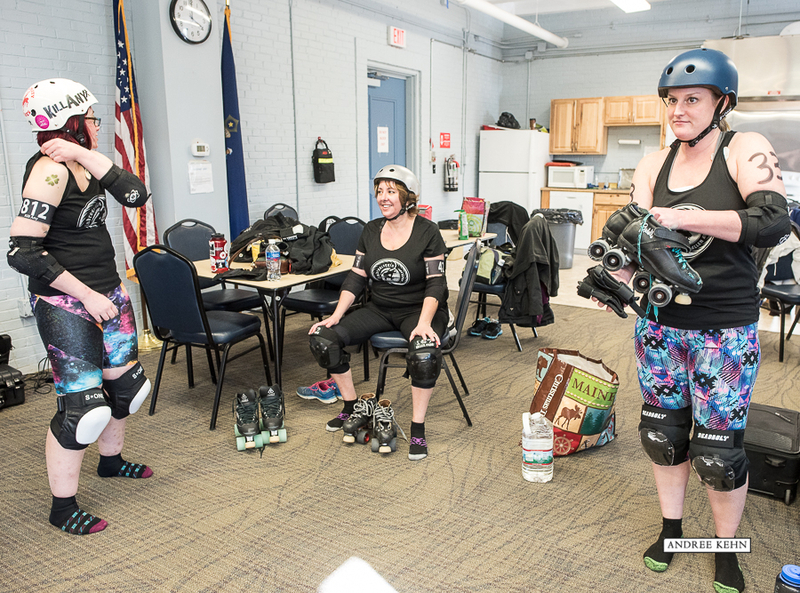 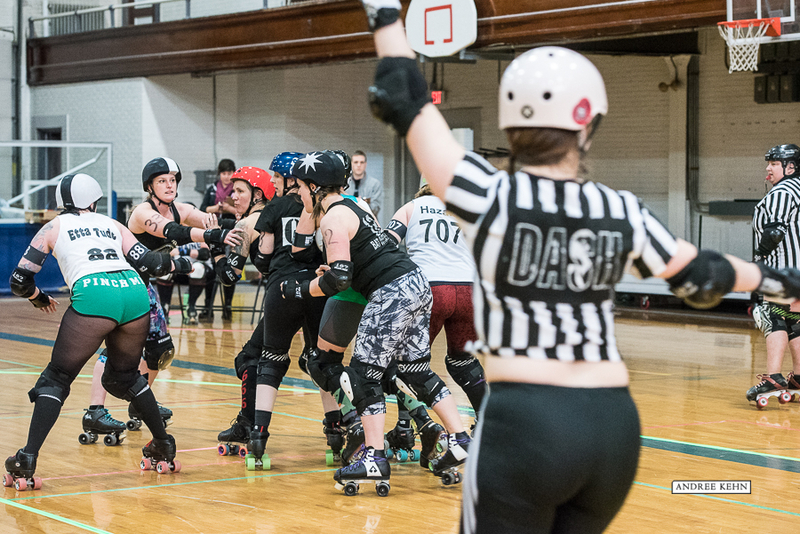 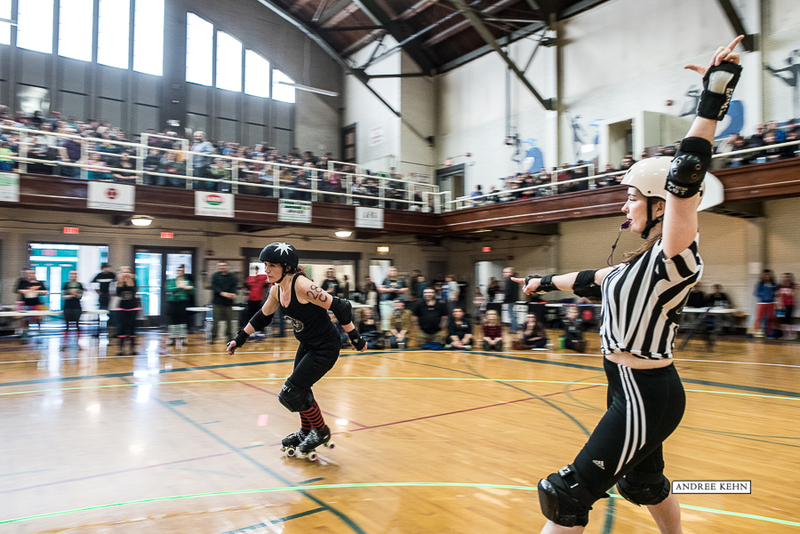 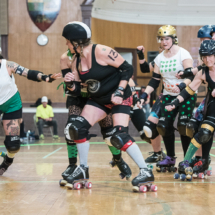 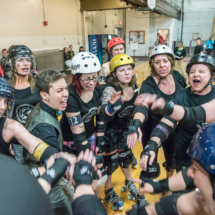 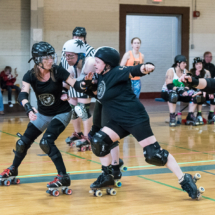 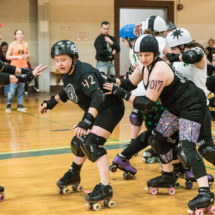 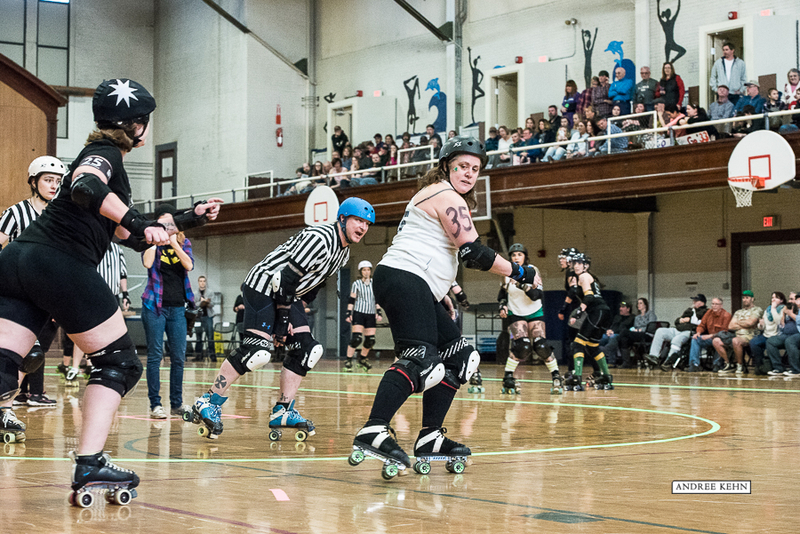 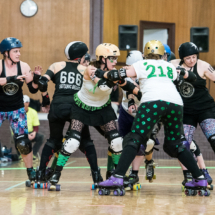 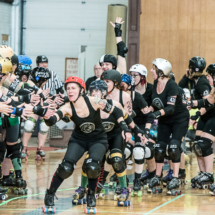 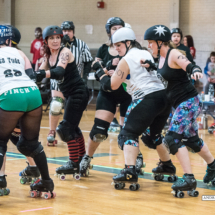 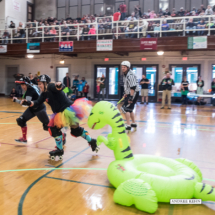 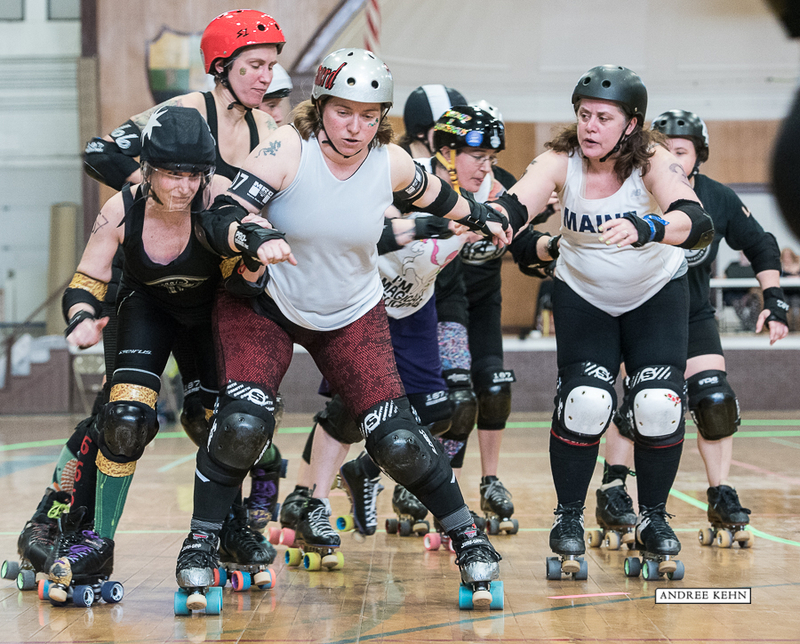 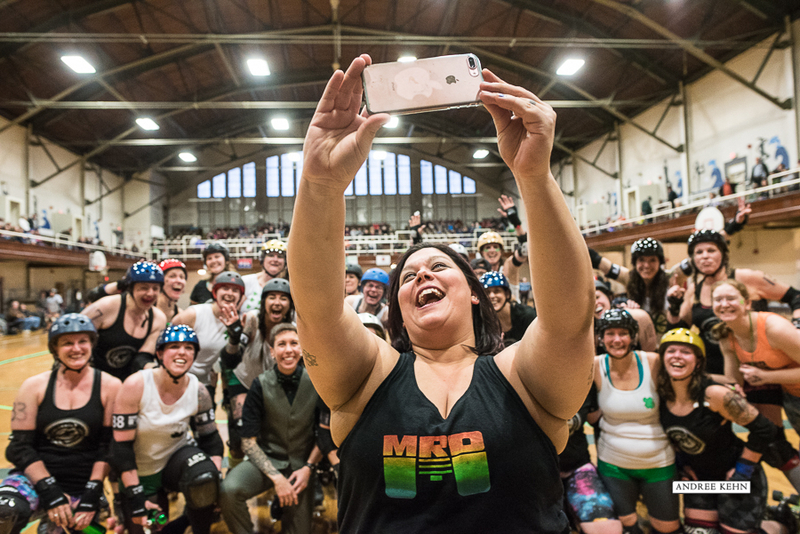 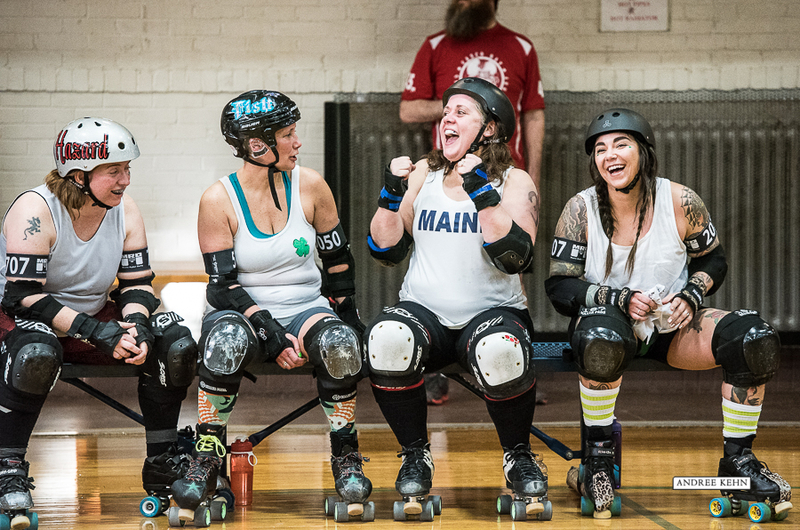 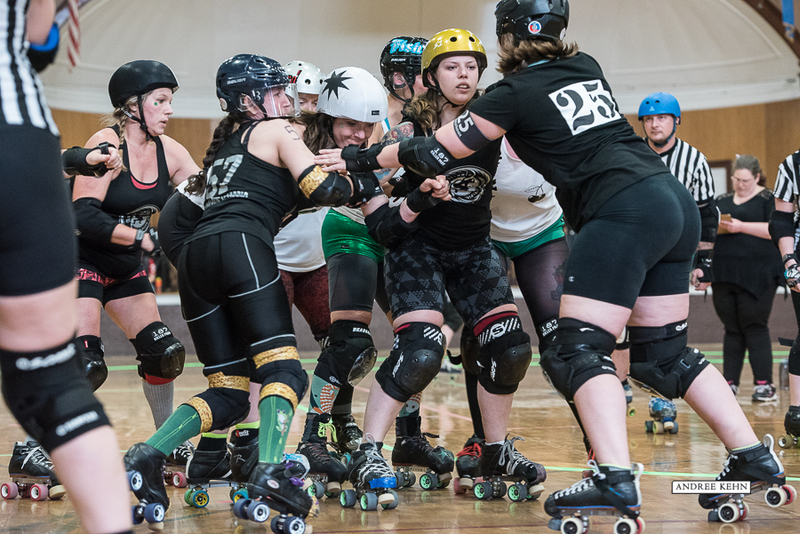 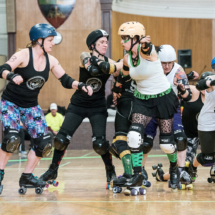 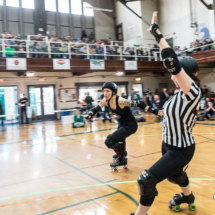 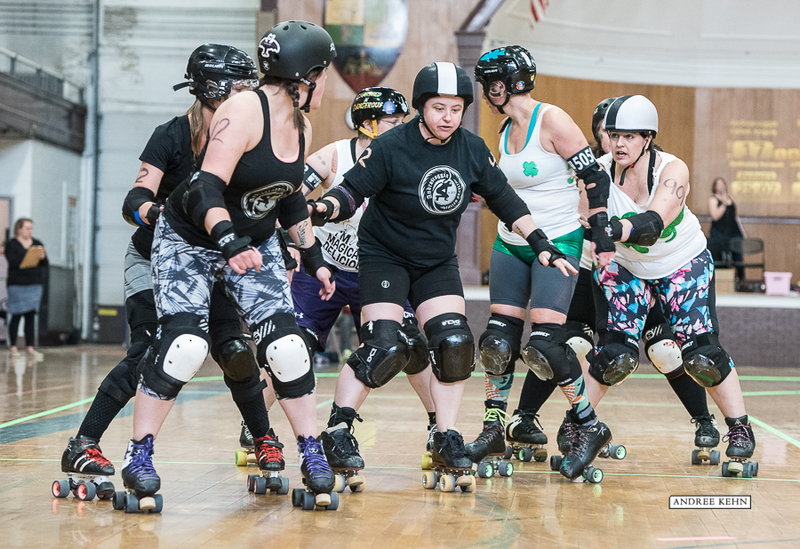 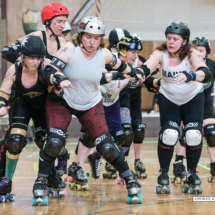 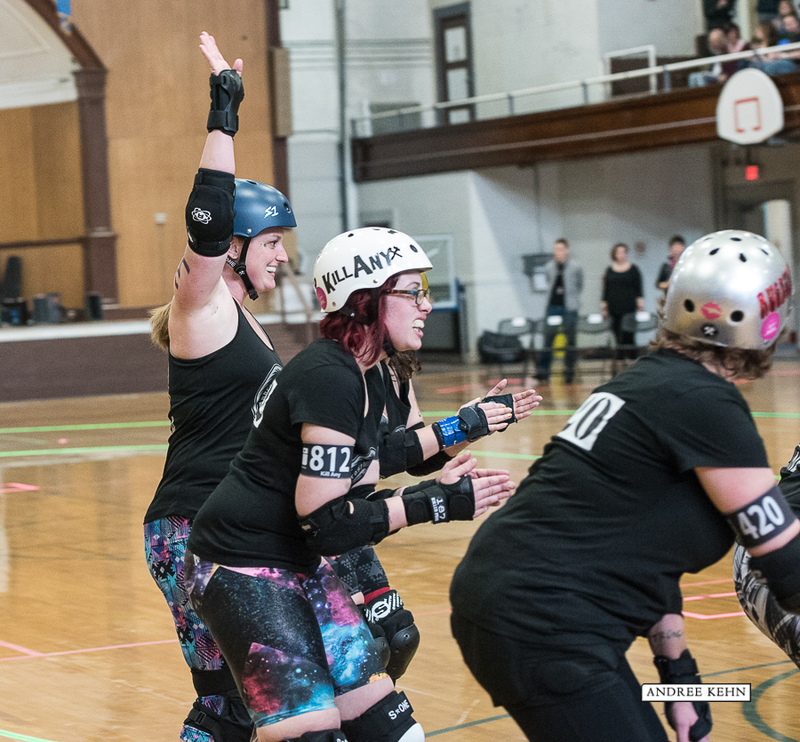 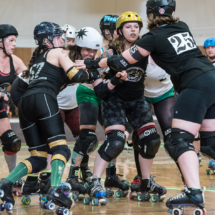 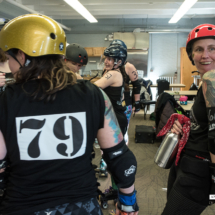 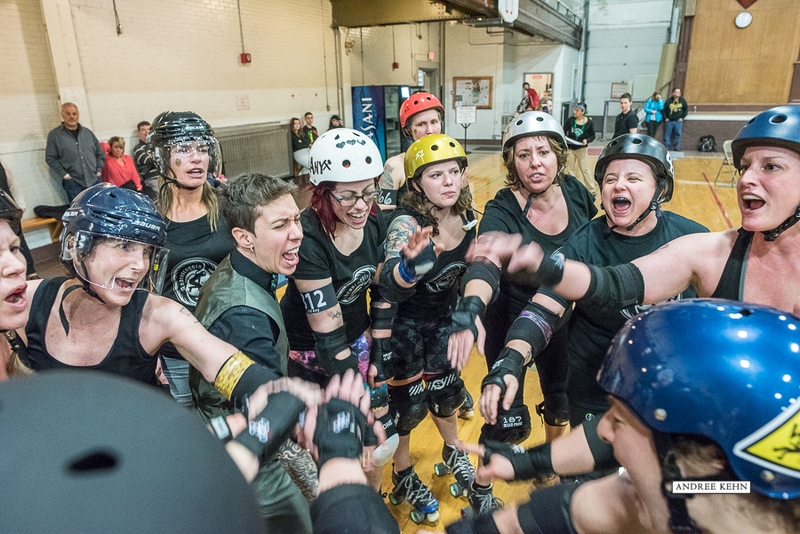 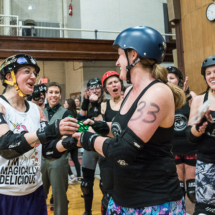 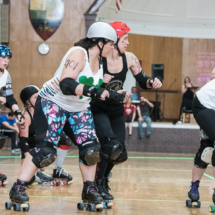 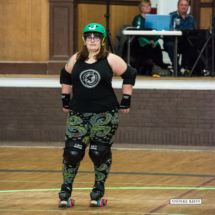 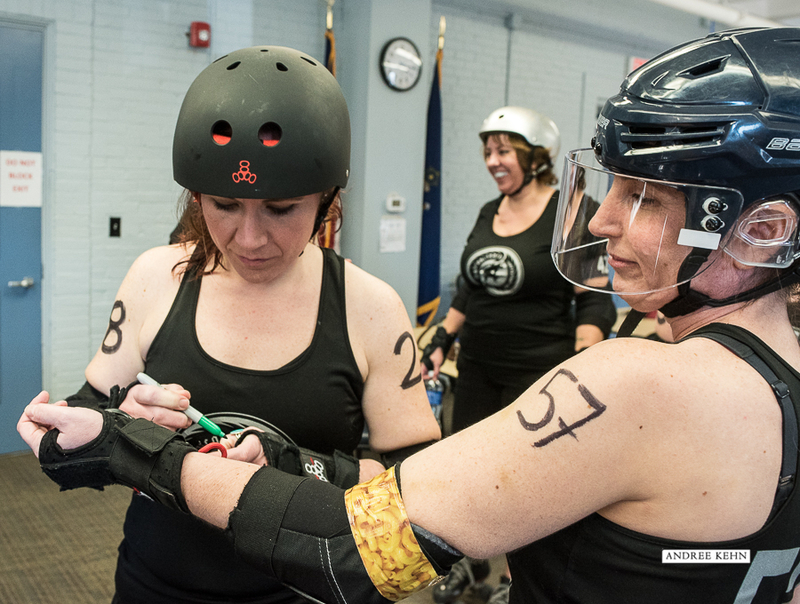 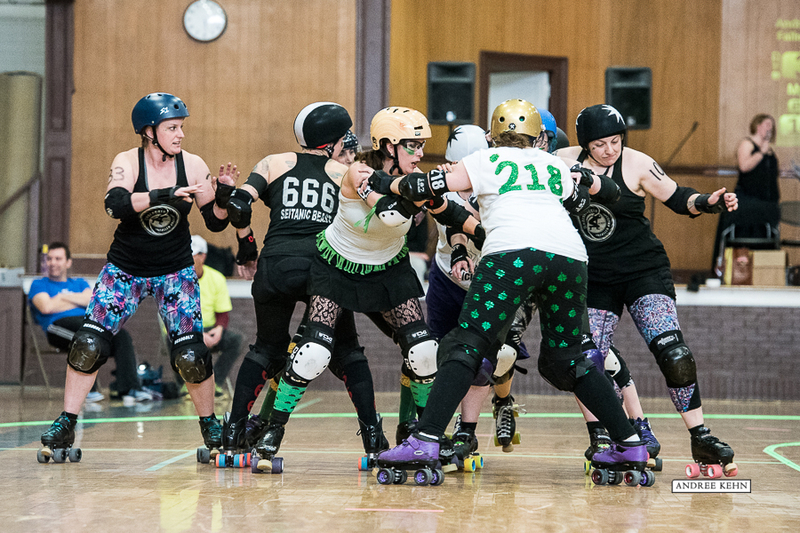 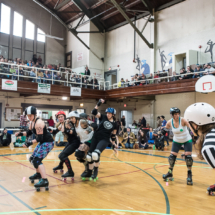 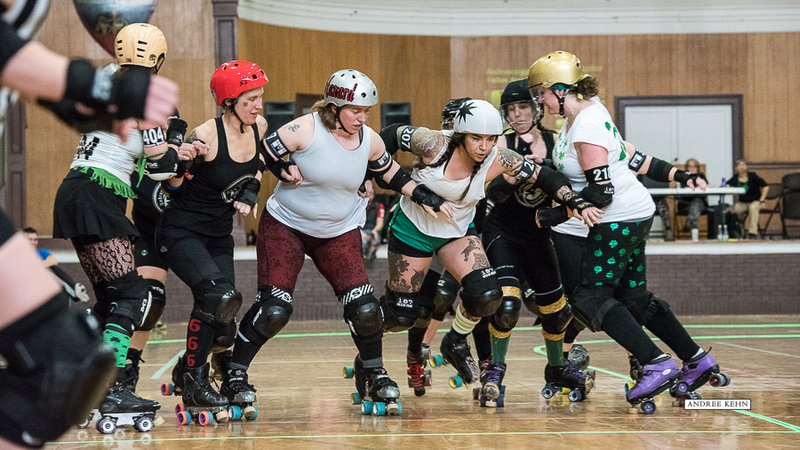 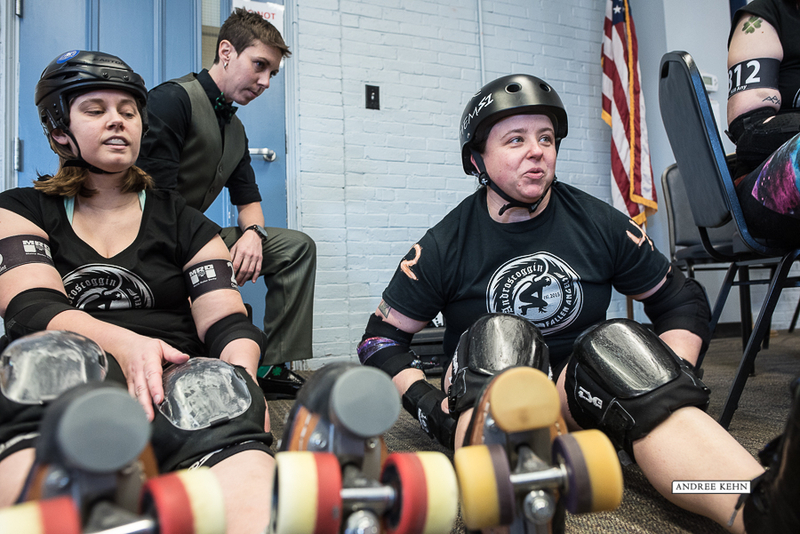 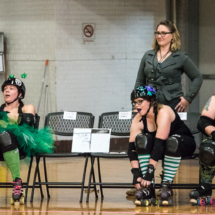 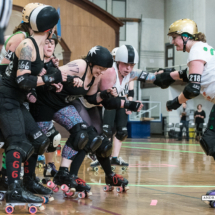 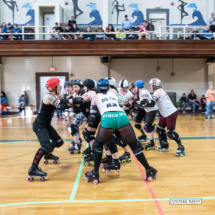 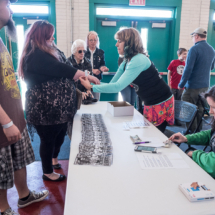 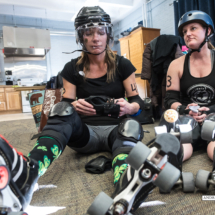 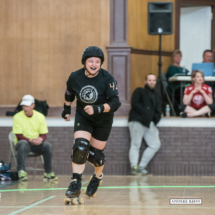 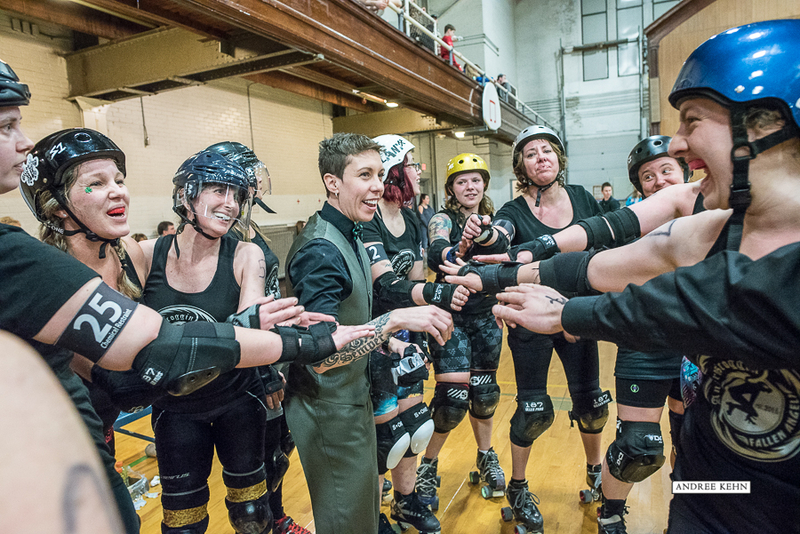 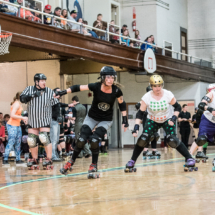 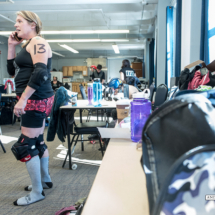 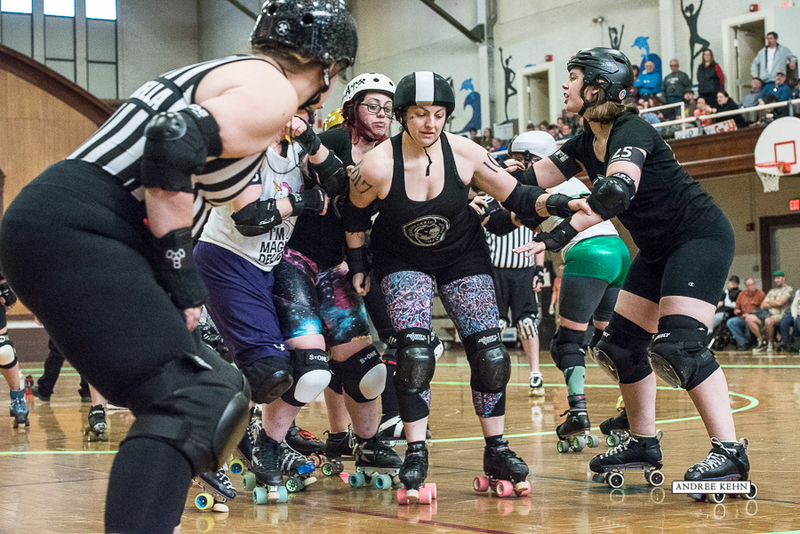 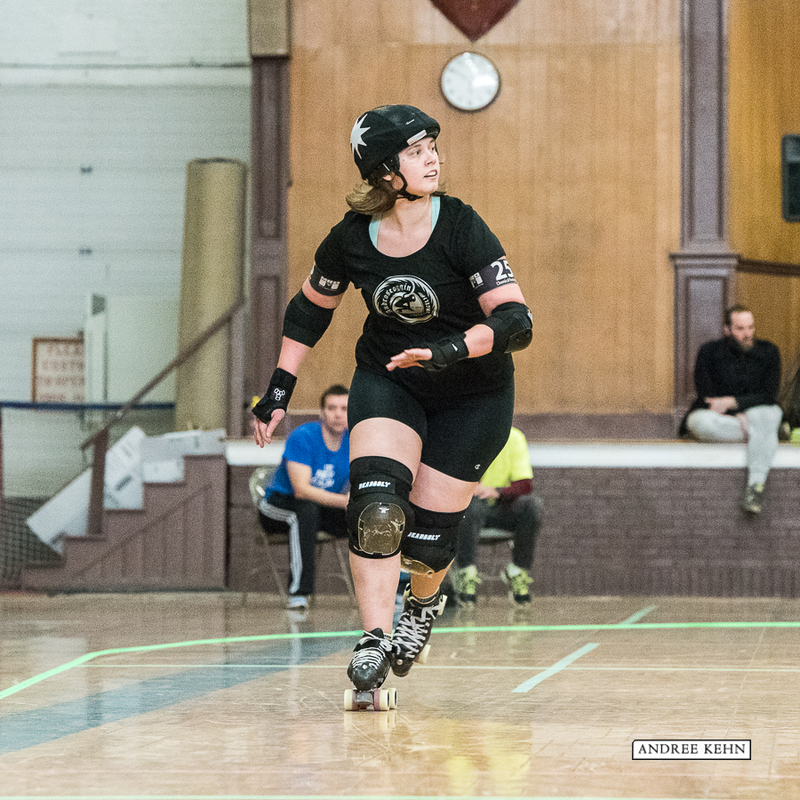 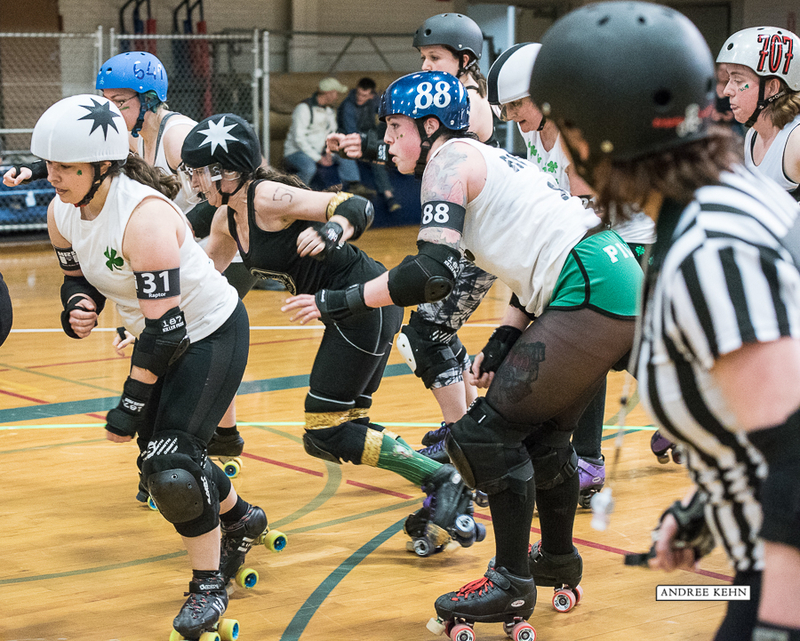 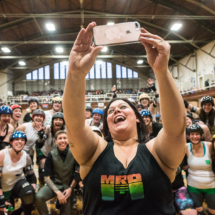 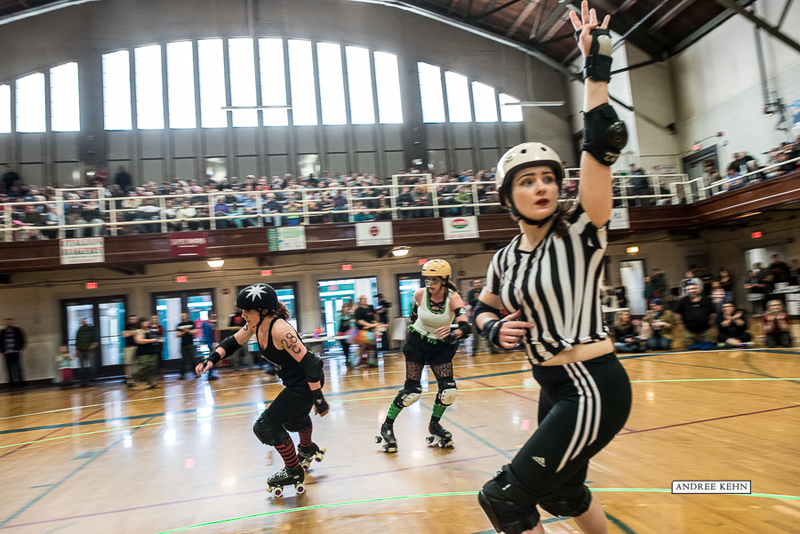 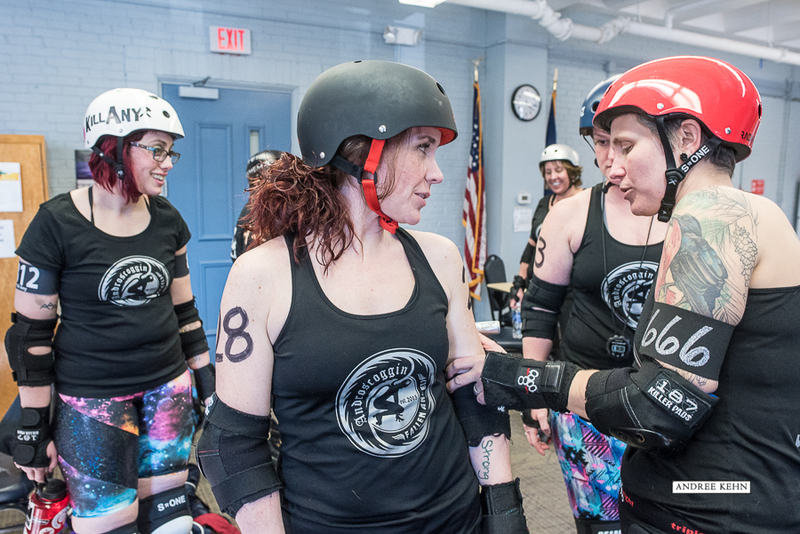 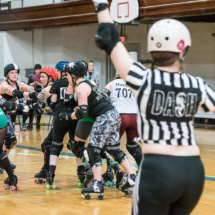 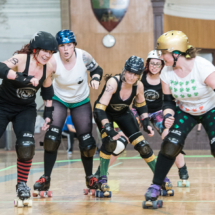 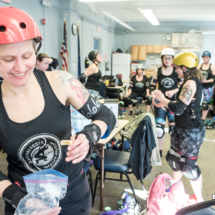 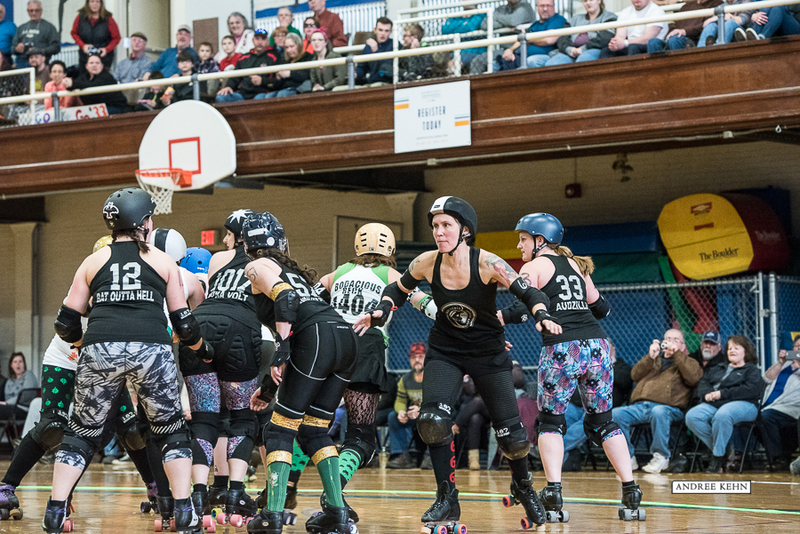 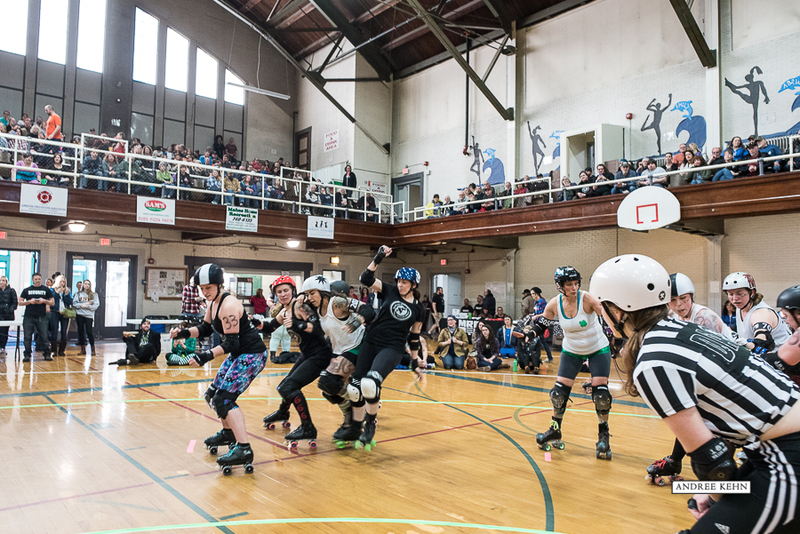 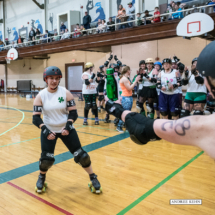 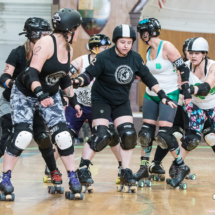 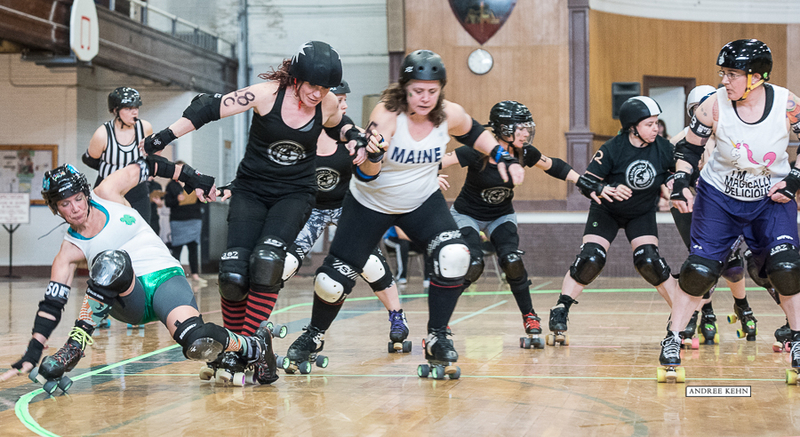 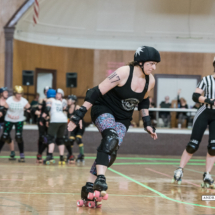 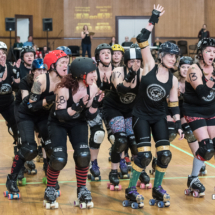 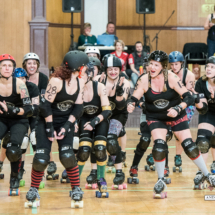 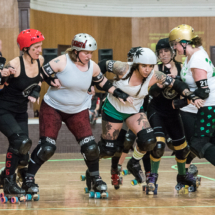 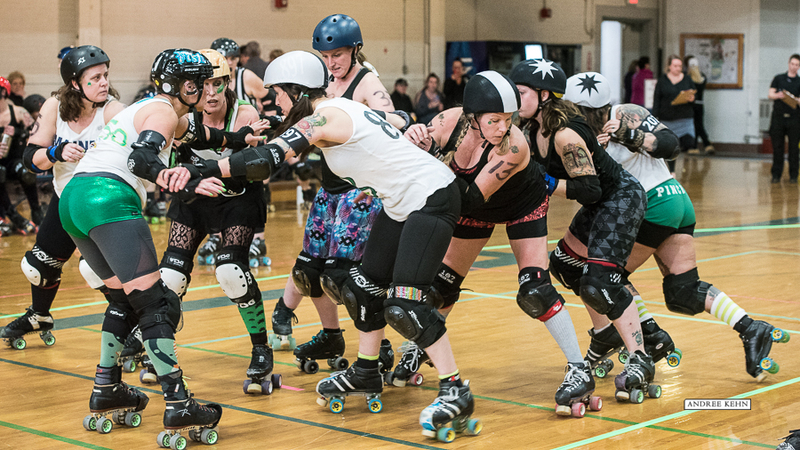 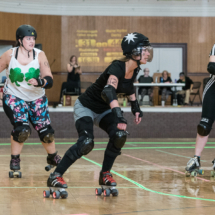 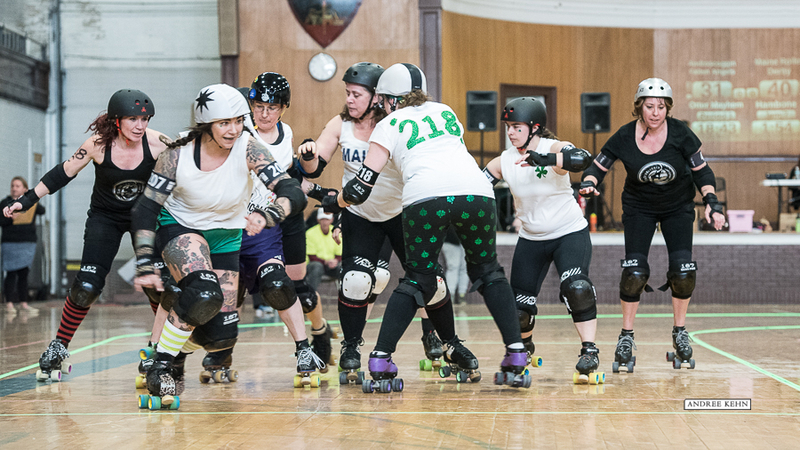 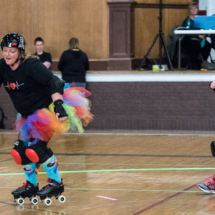 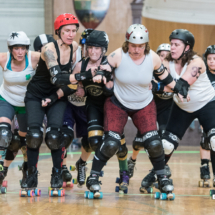 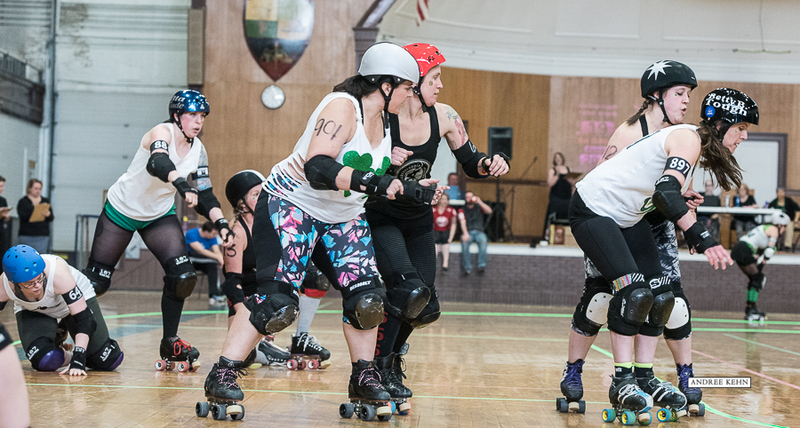 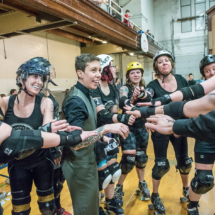 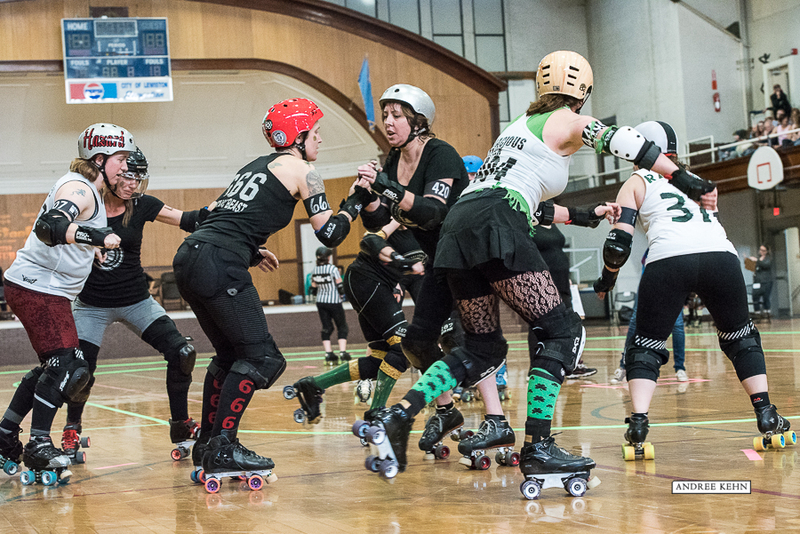 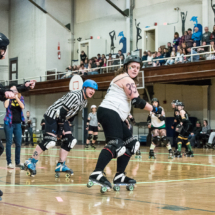 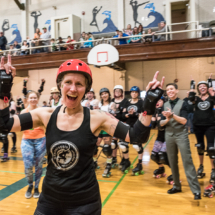 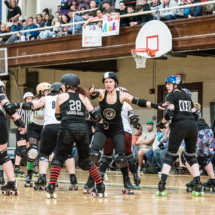 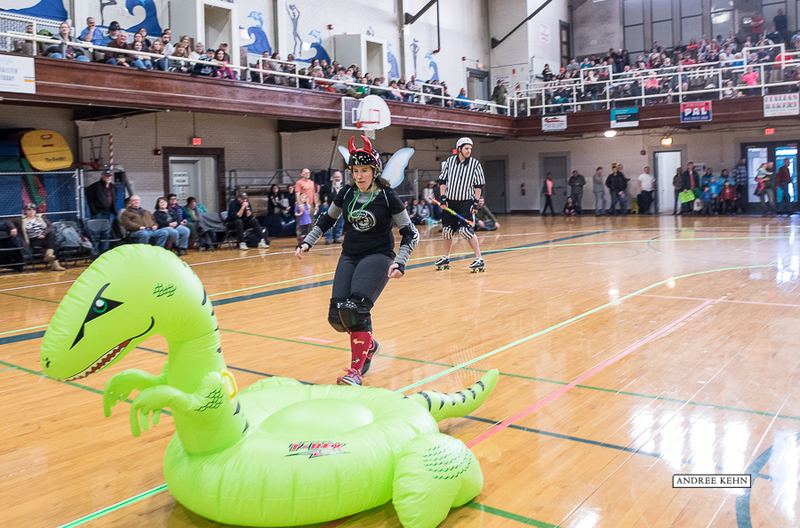 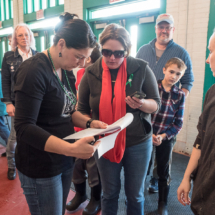 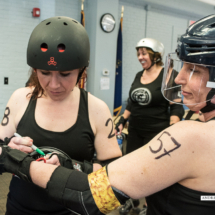 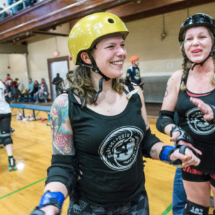 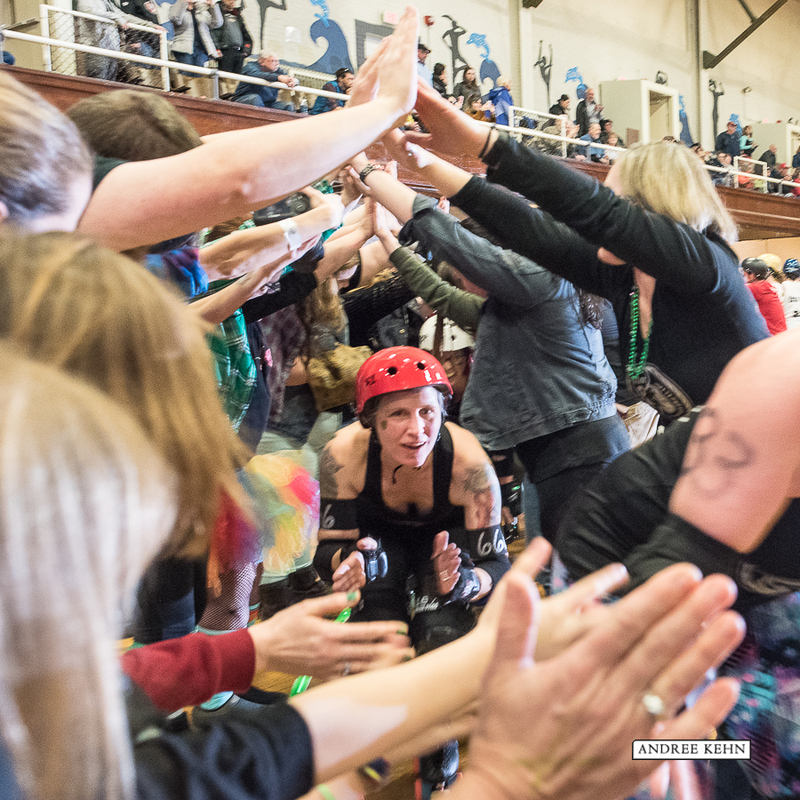 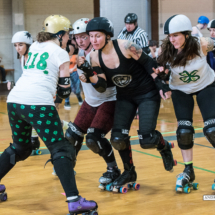 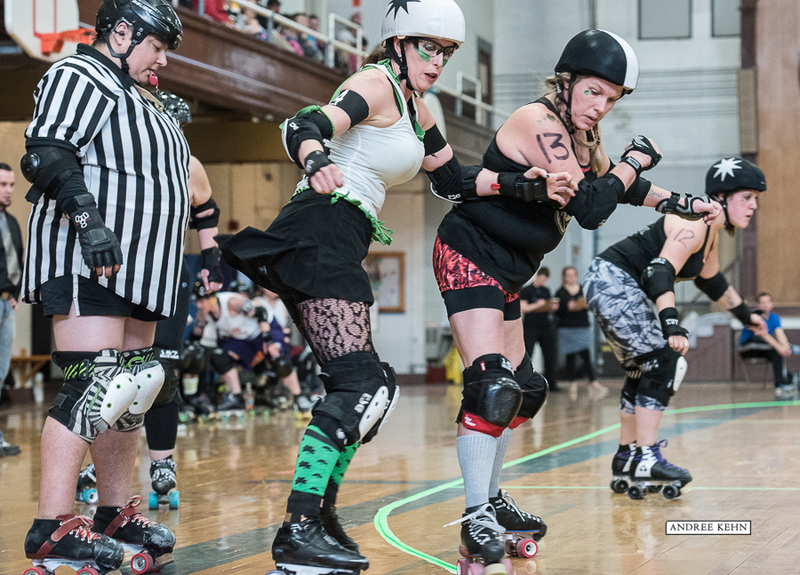 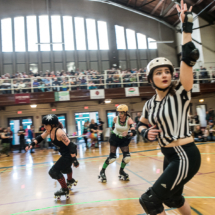 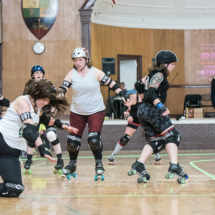 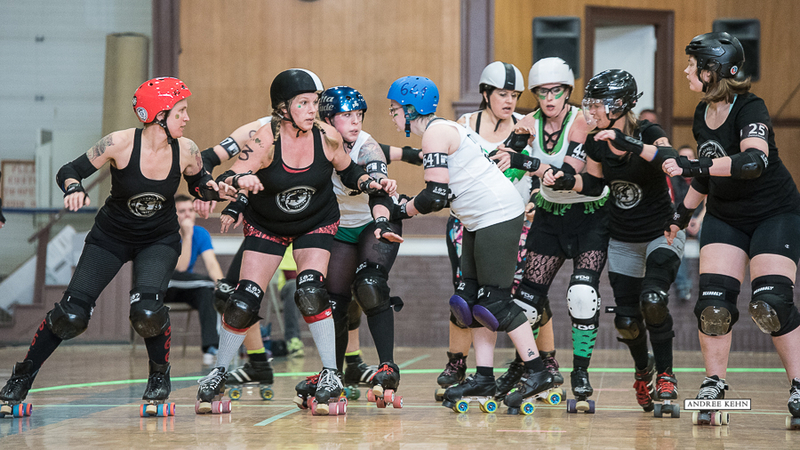 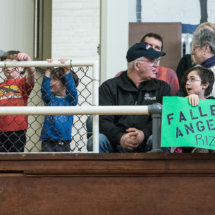 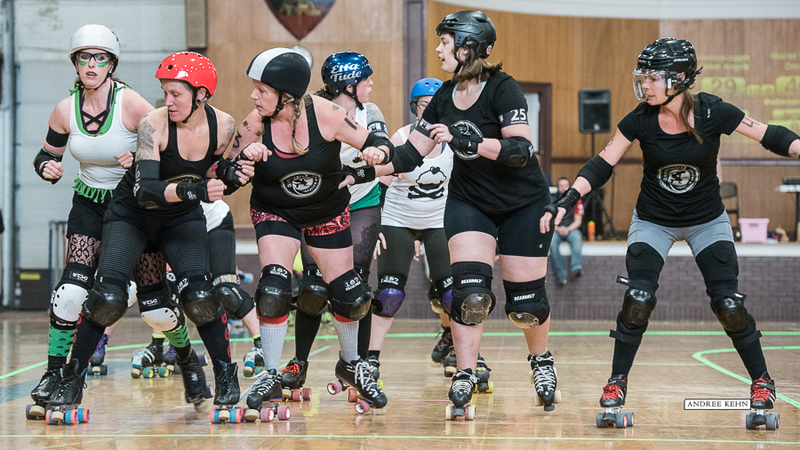 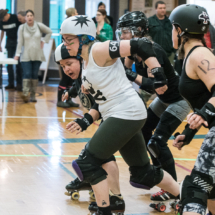 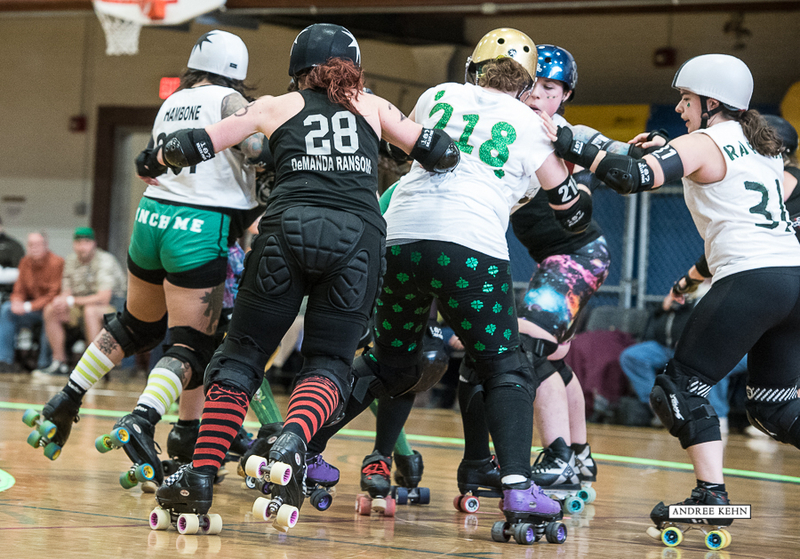 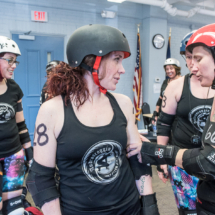 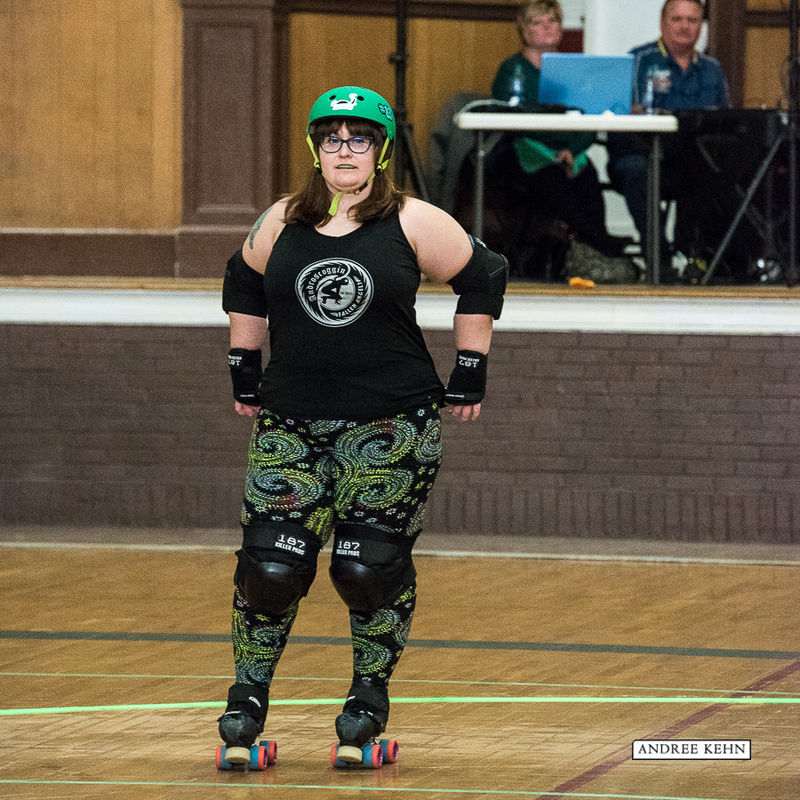 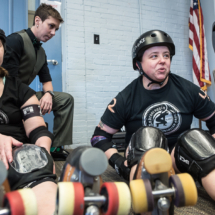 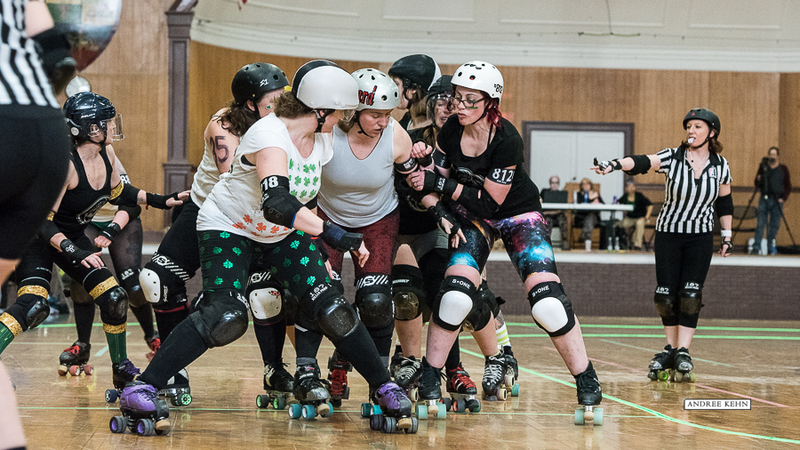 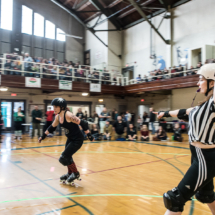 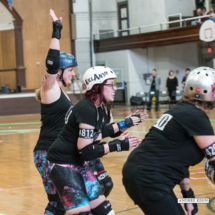 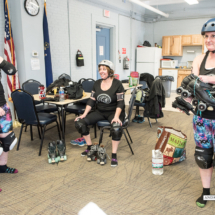 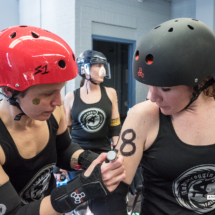 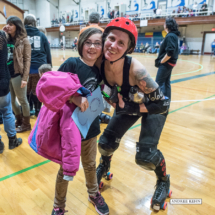 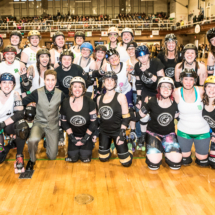 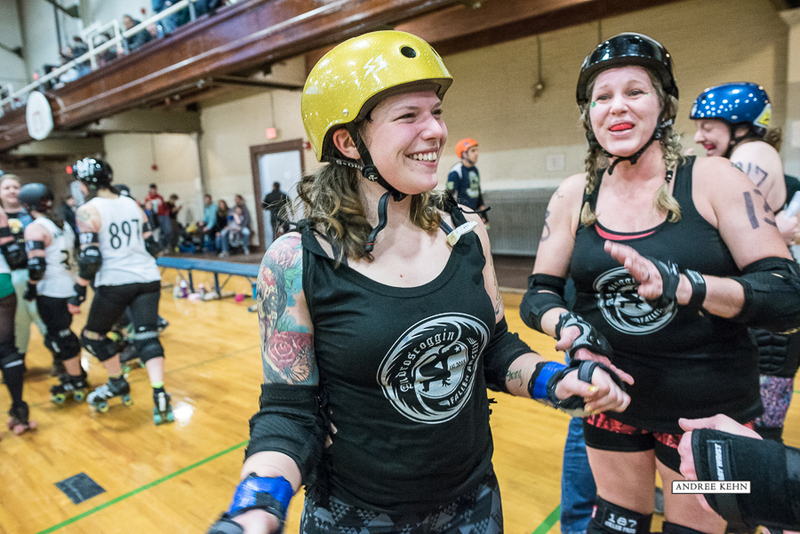 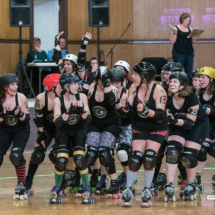 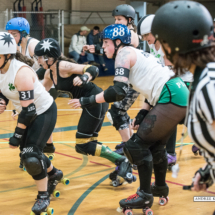 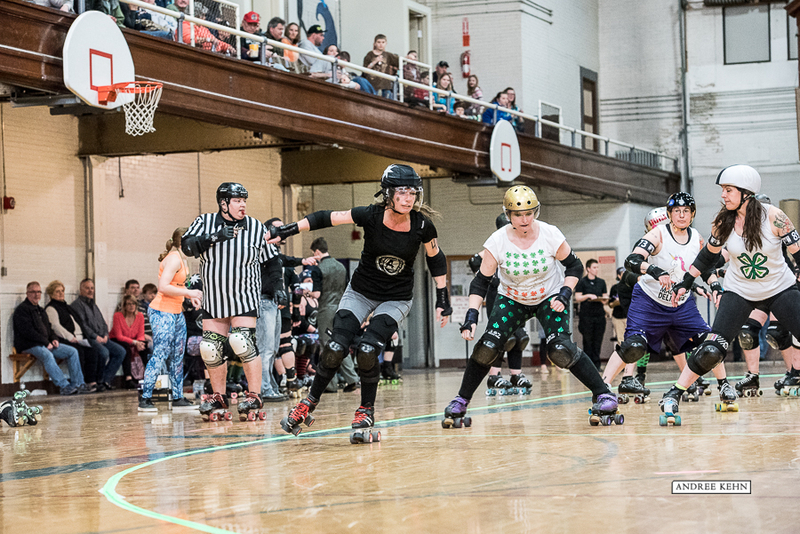 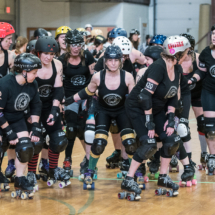 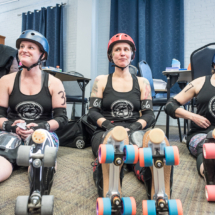 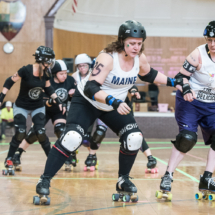 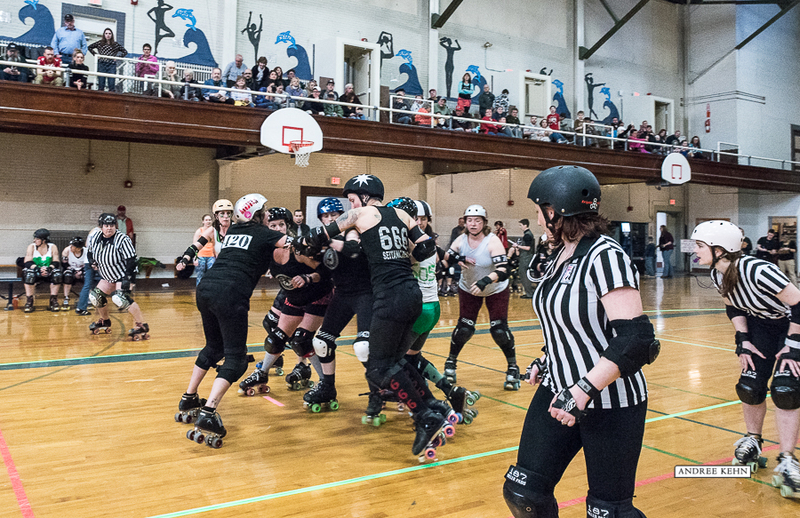 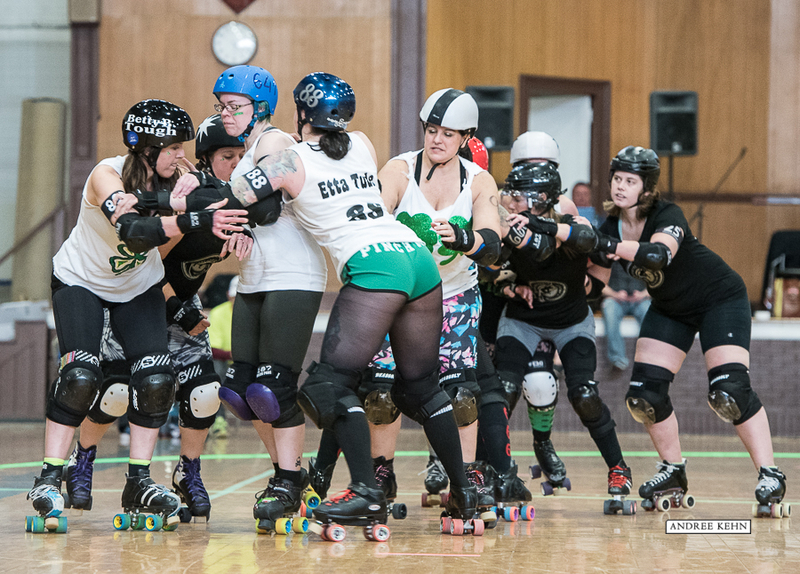 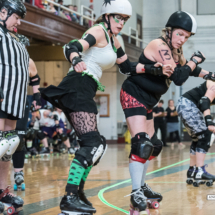 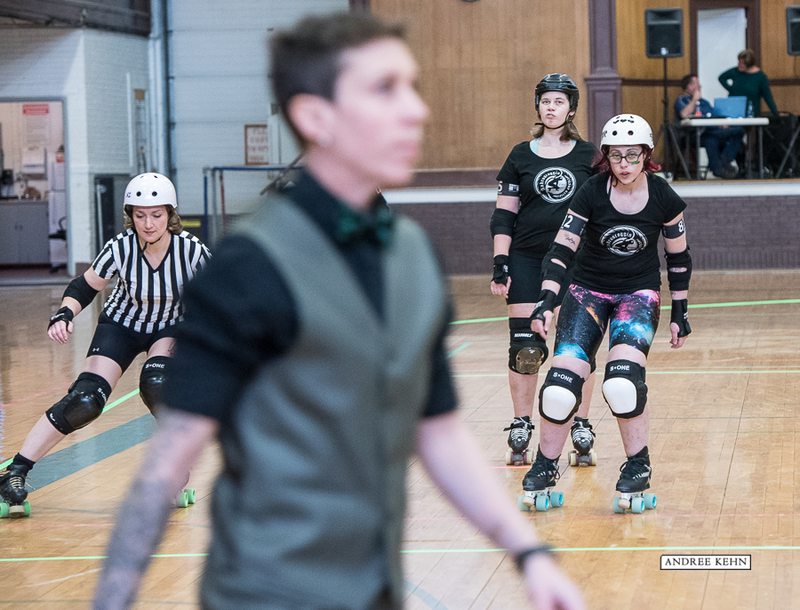 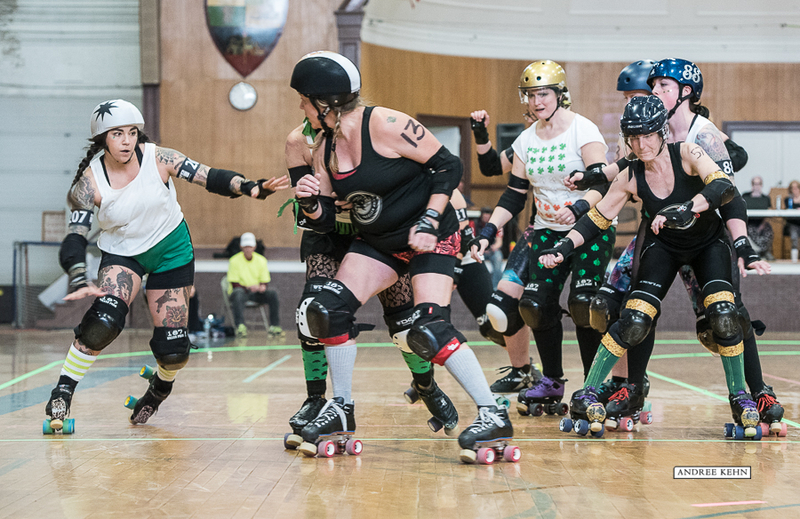 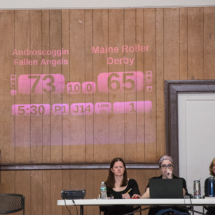 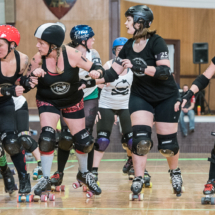 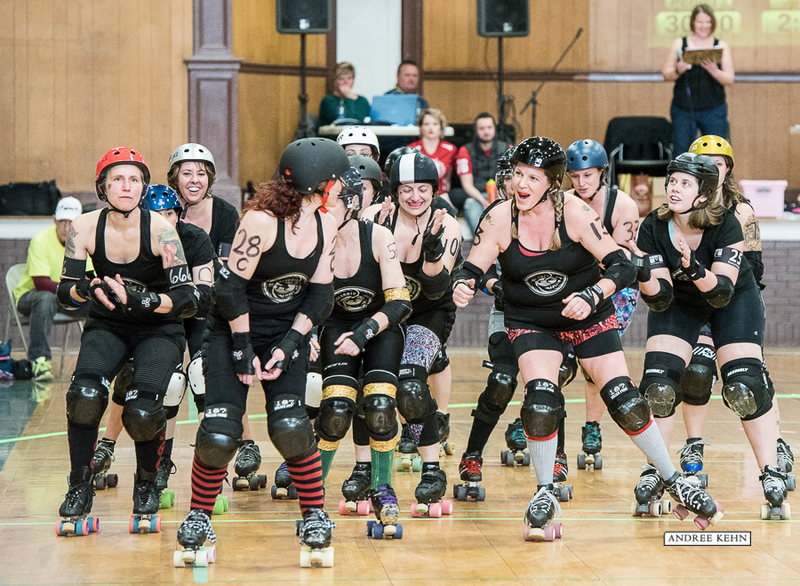 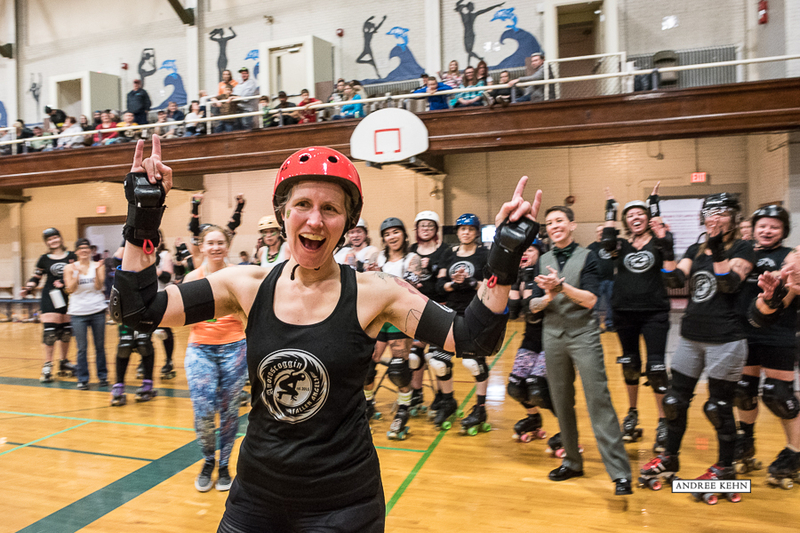 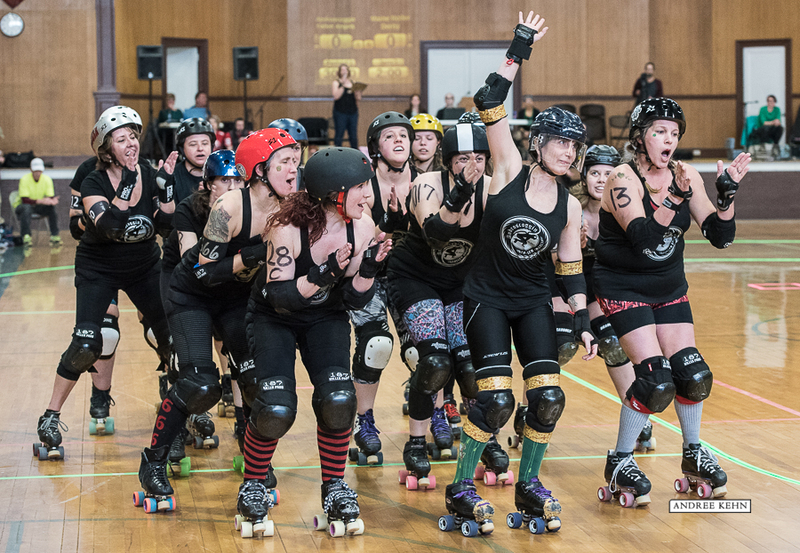 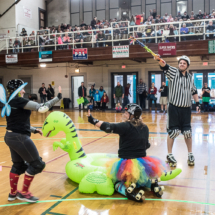 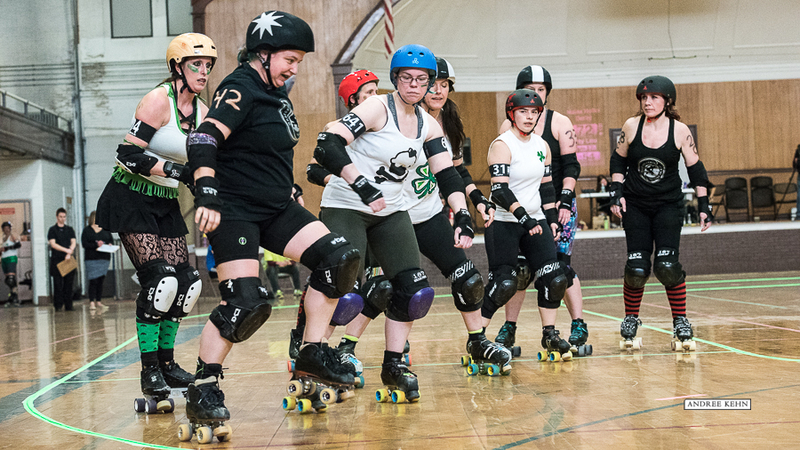 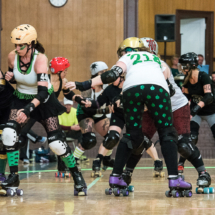 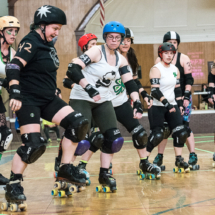 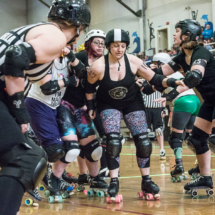 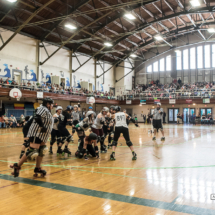 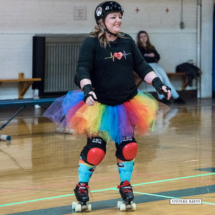 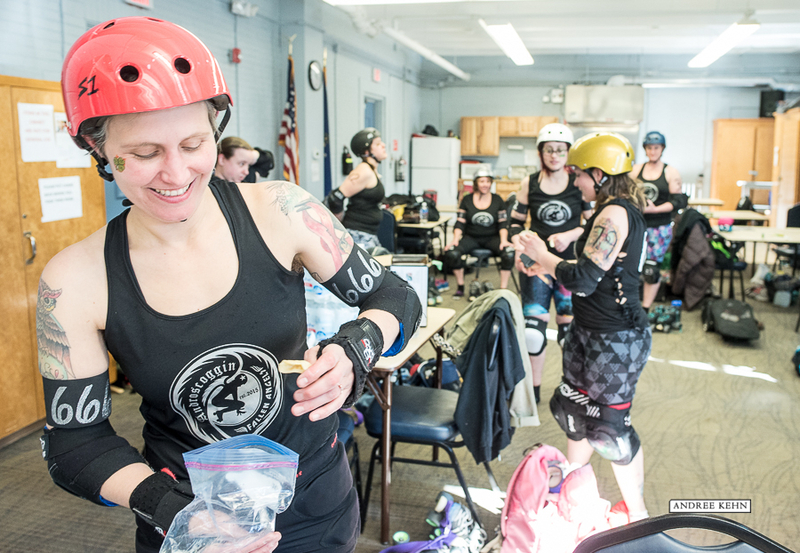 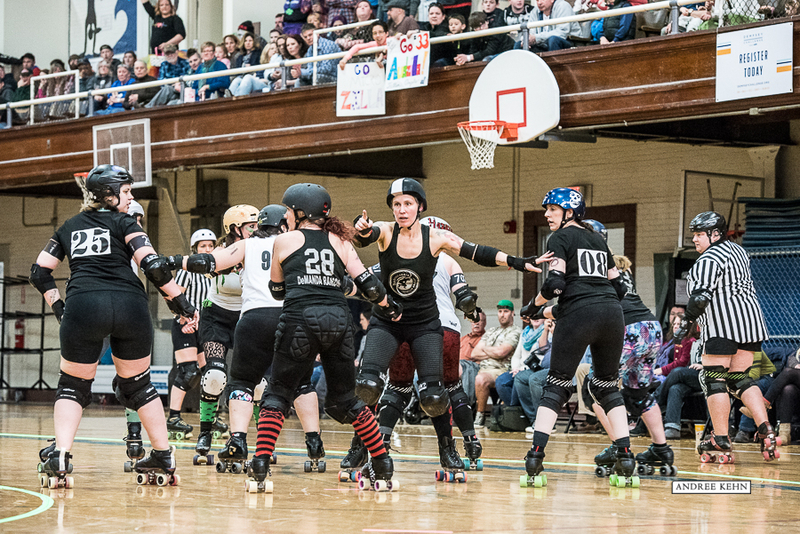 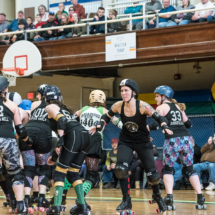 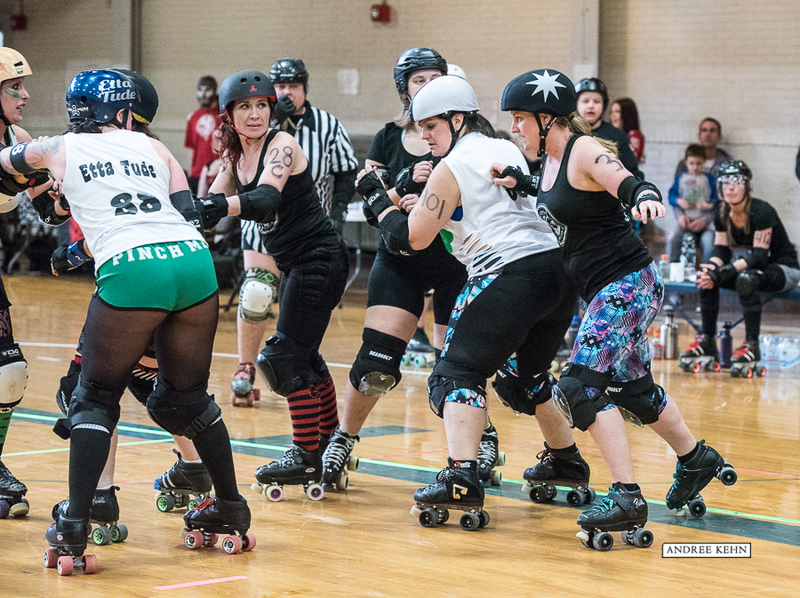 The Androscoggin Fallen Angels met the Maine Roller Derby Team for their very first bout in Lewiston on Saturday at the Armory in front of a packed house. 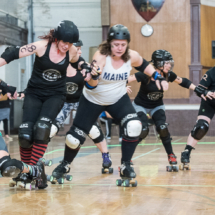 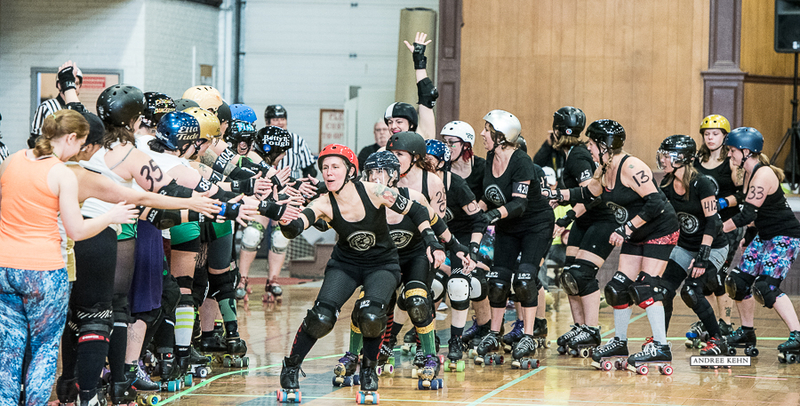 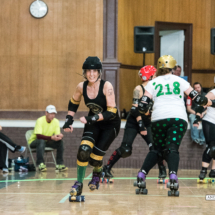 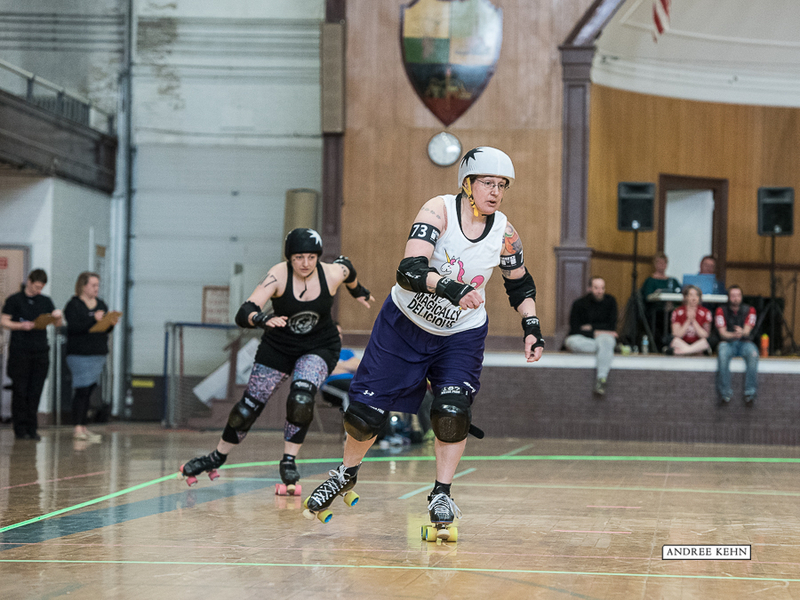 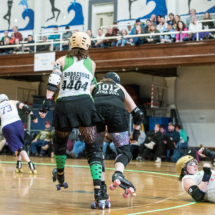 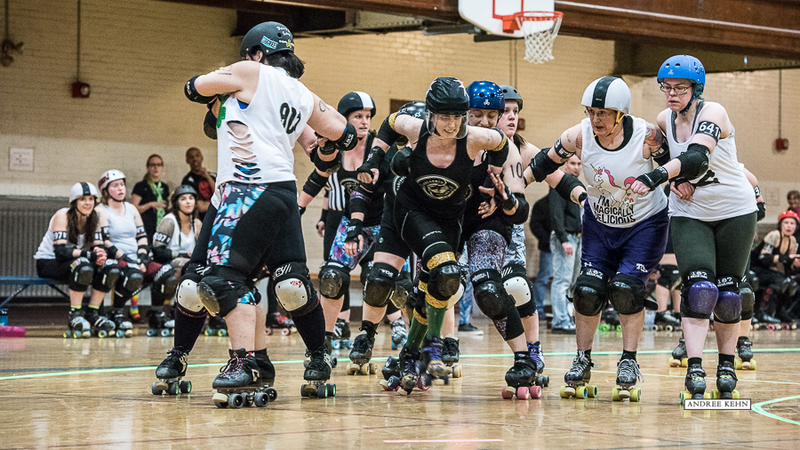 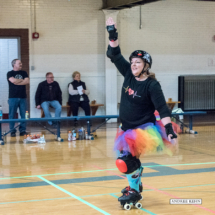 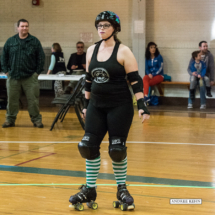 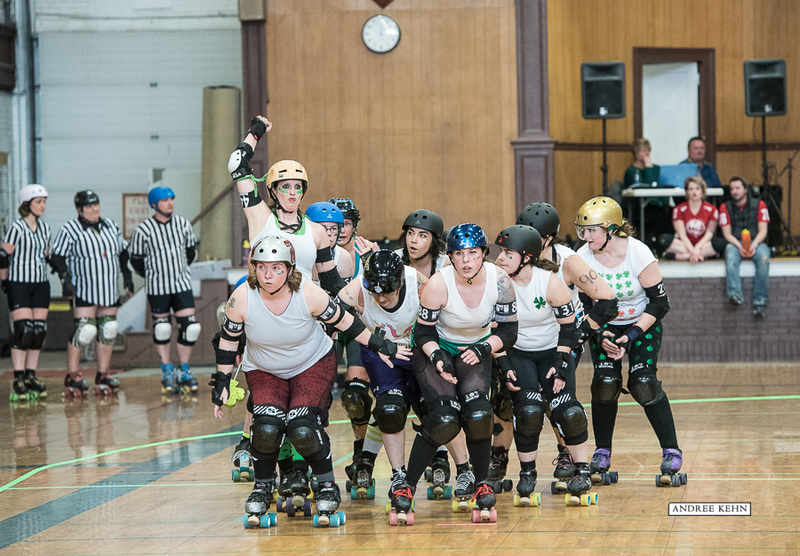 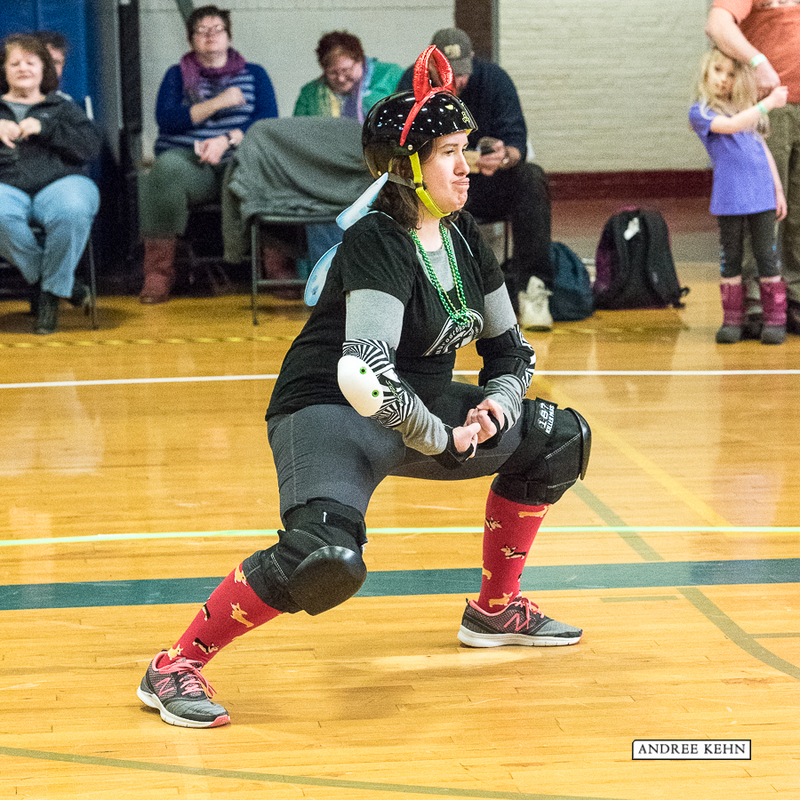 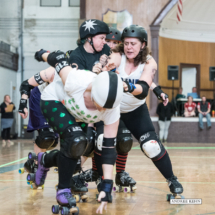 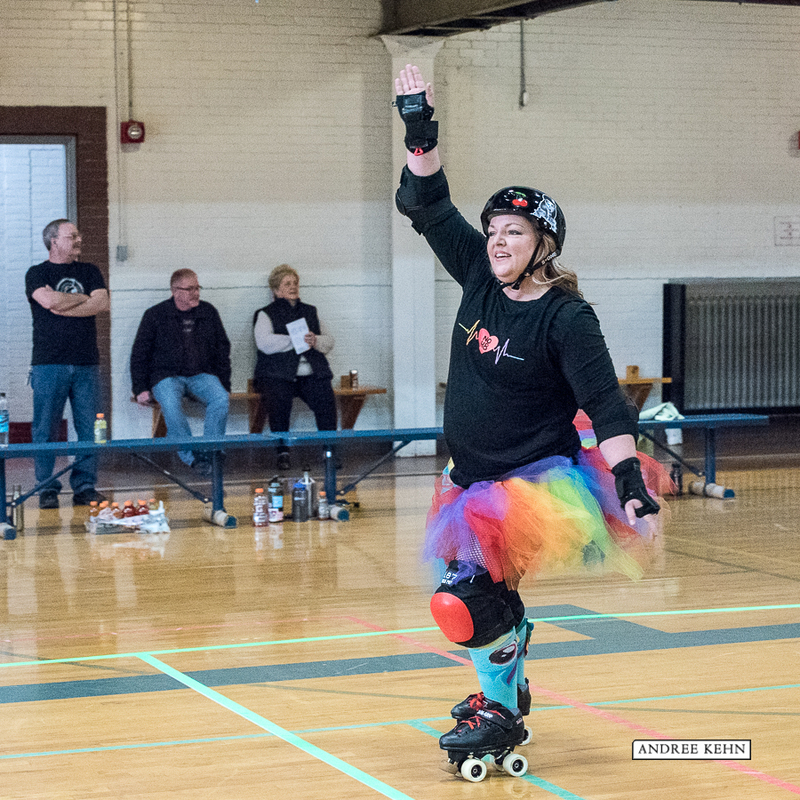 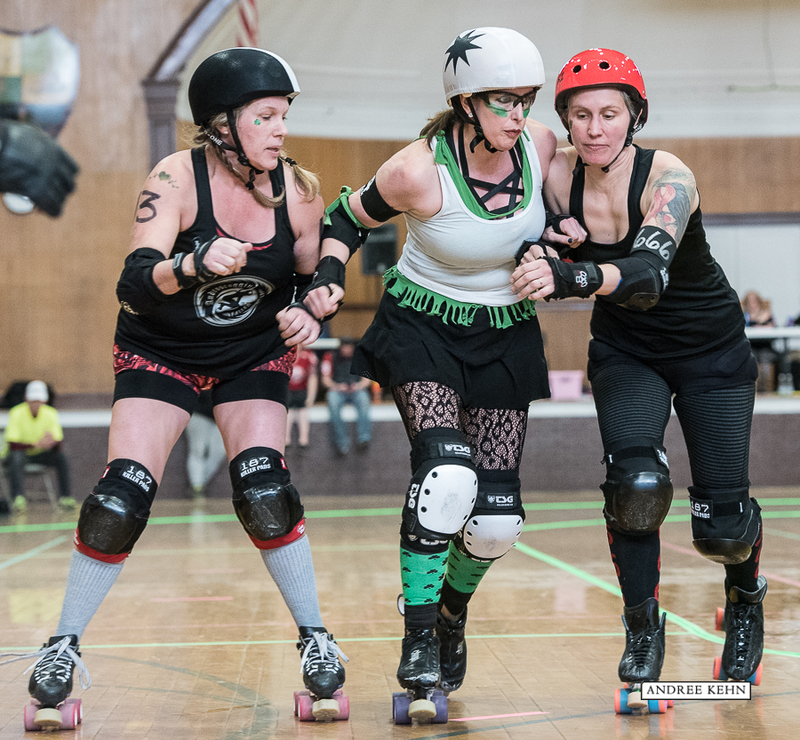 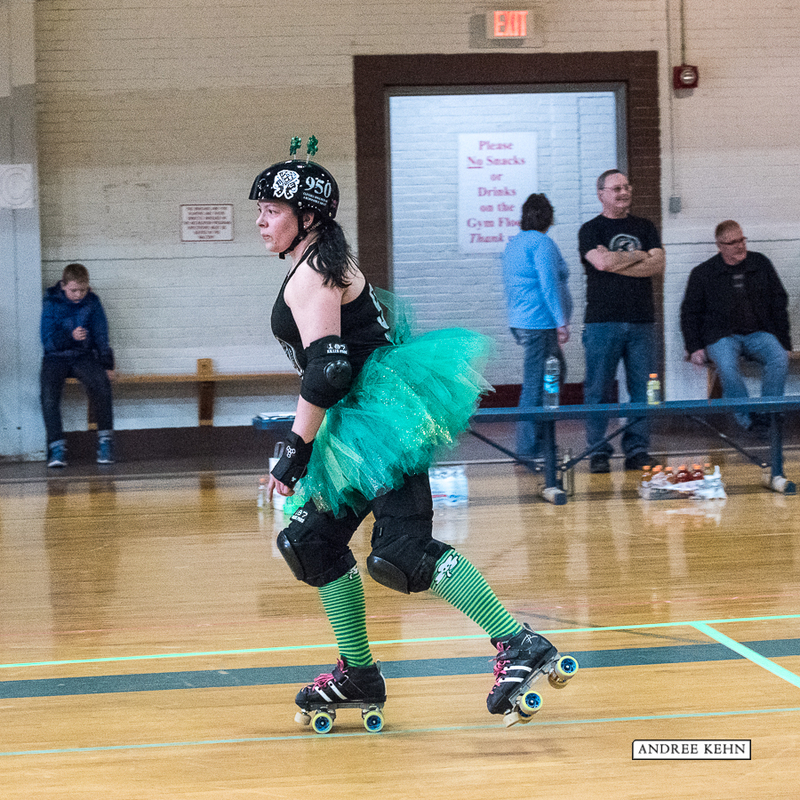 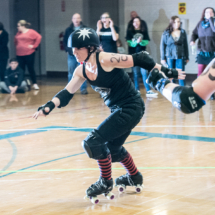 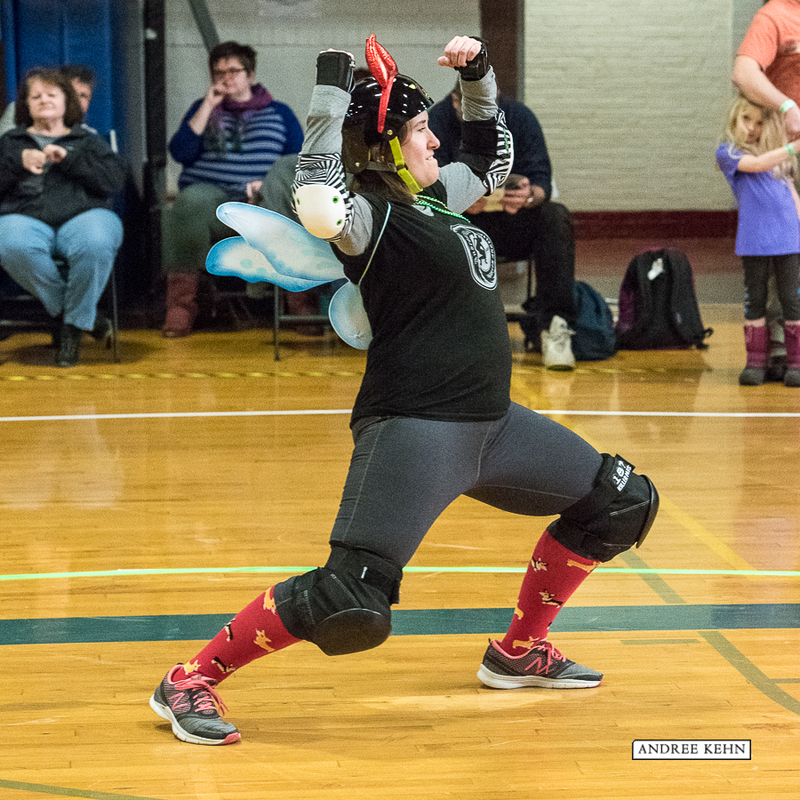 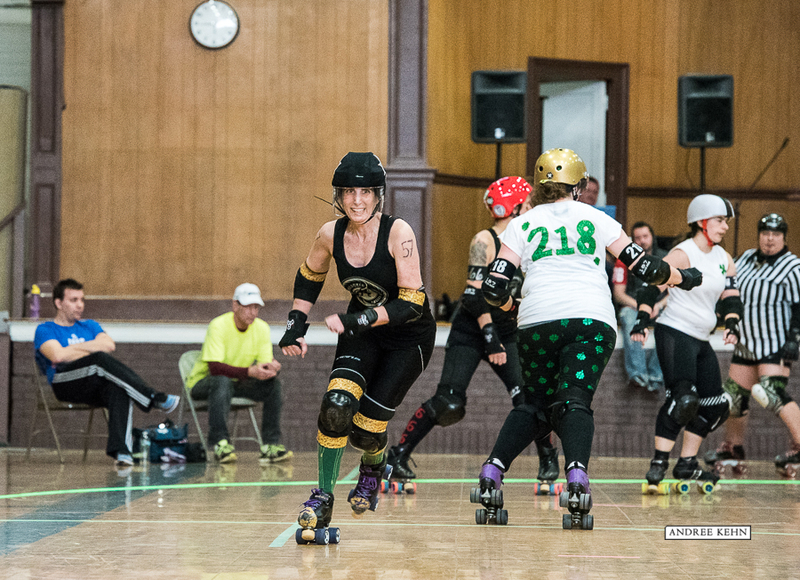 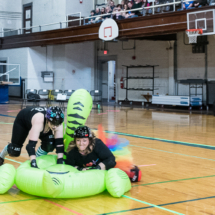 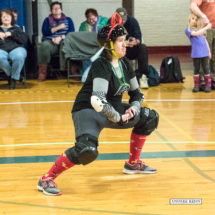 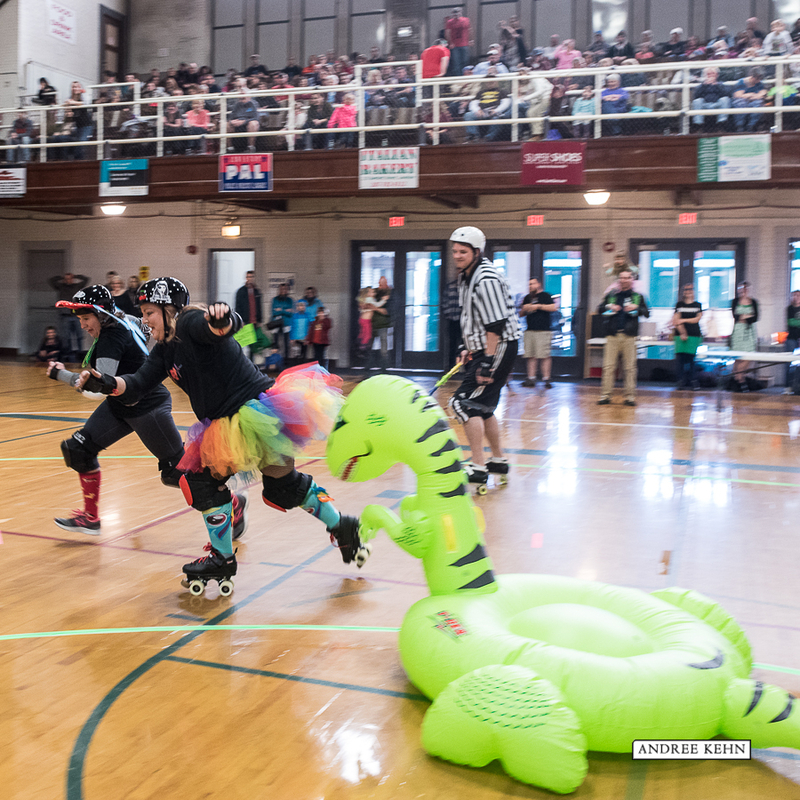 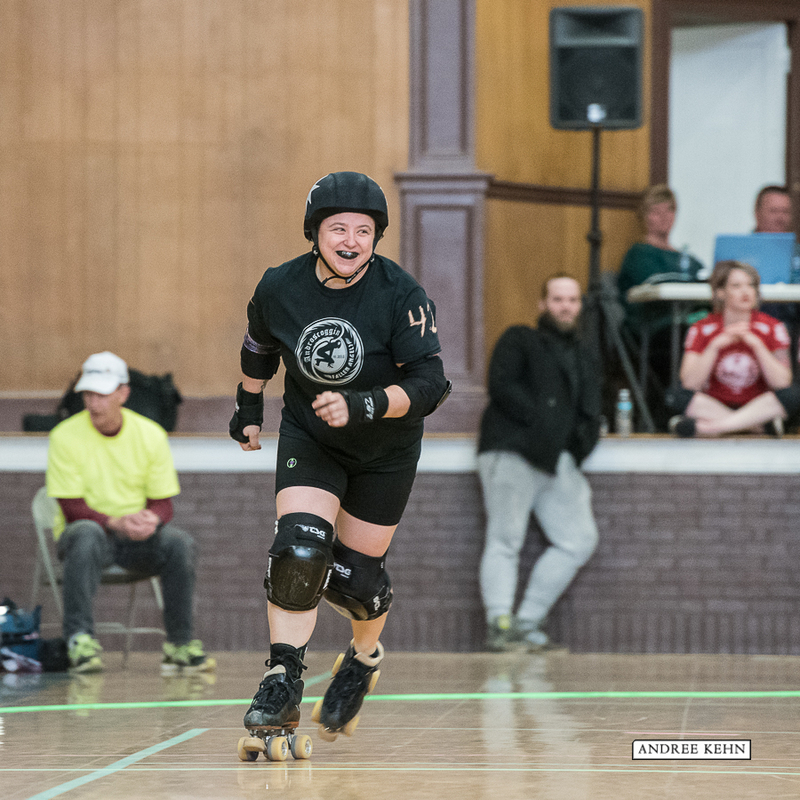 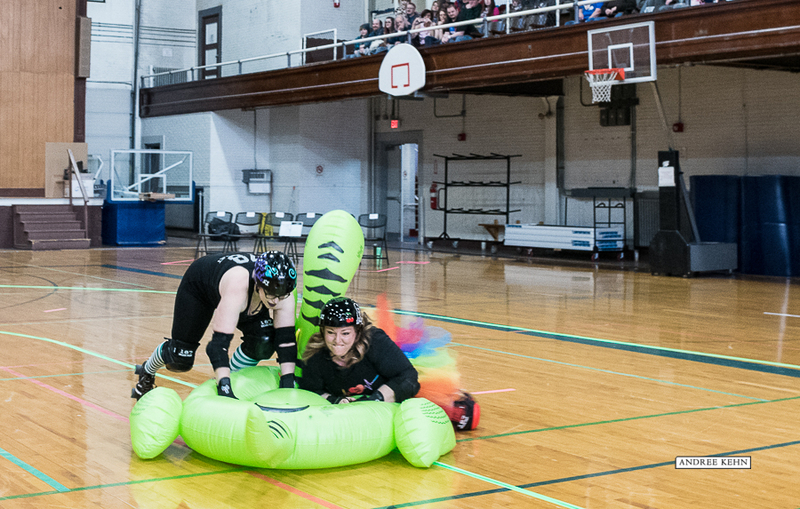 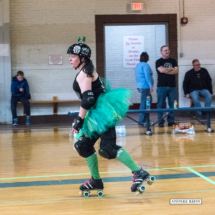 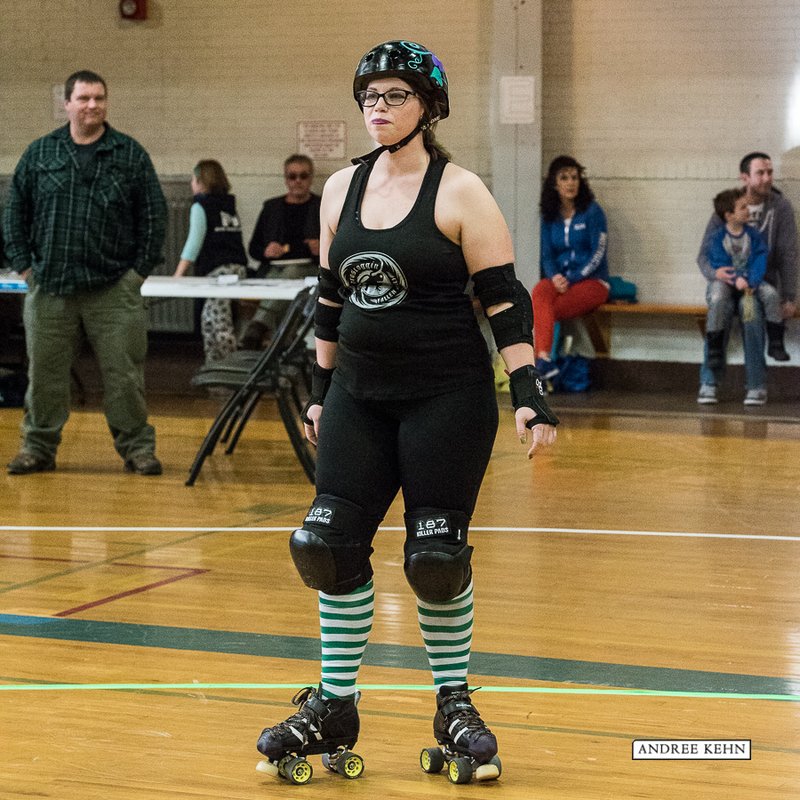 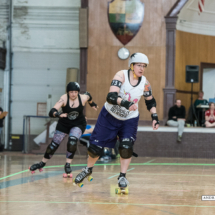 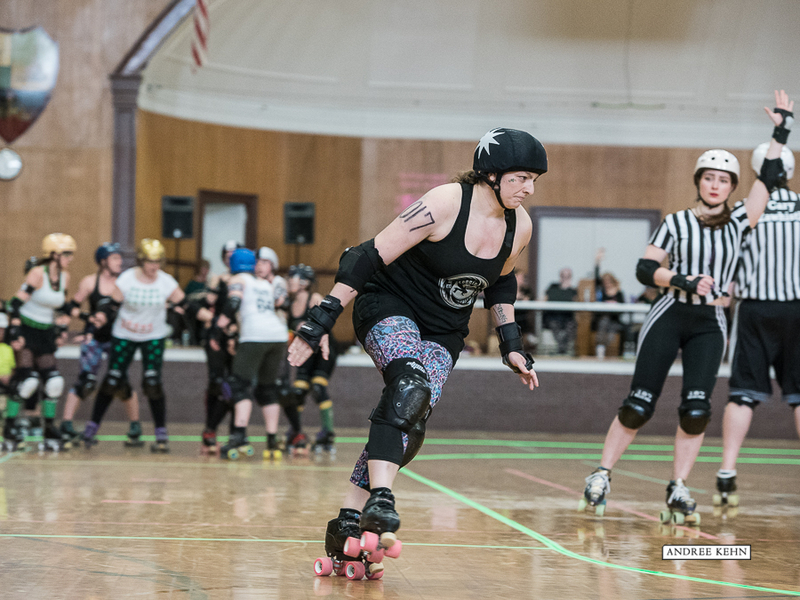 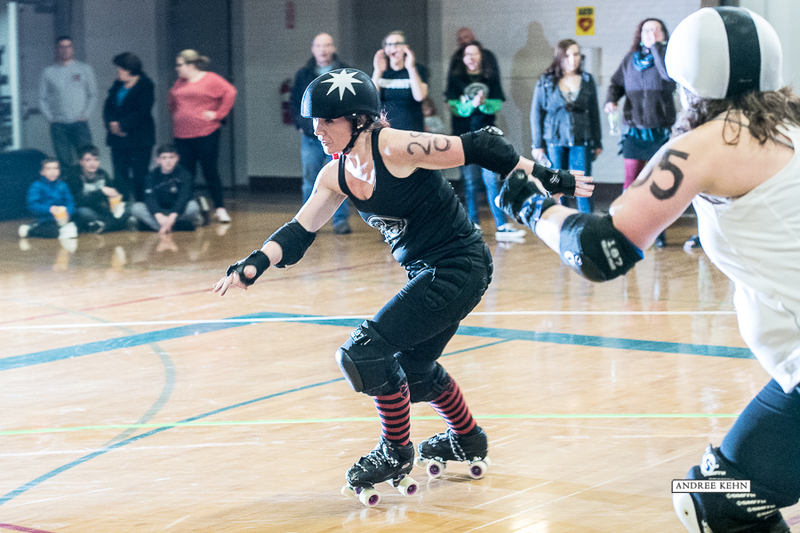 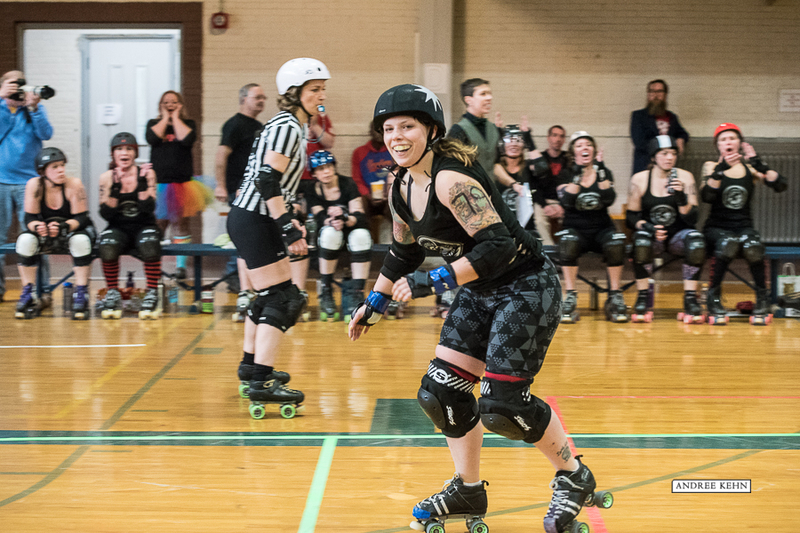 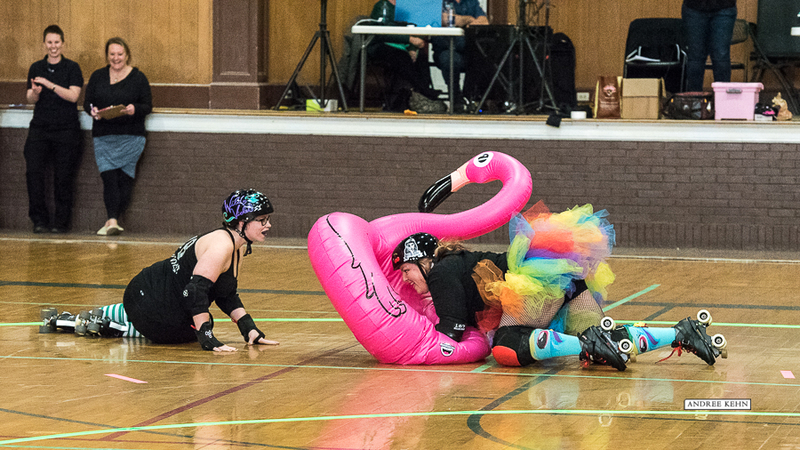 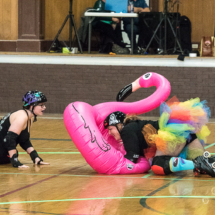 Amy "Scandalous Scorpio" Genick breaks free from the pack duing the Androscoggin Fallen Angels very first home bout at the SArmory on Saturday. 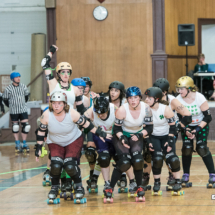 The Androscoggin Fallen Angels go through a tunnel at the conclusion of their very first home bout, held at the Armory on Saturday.